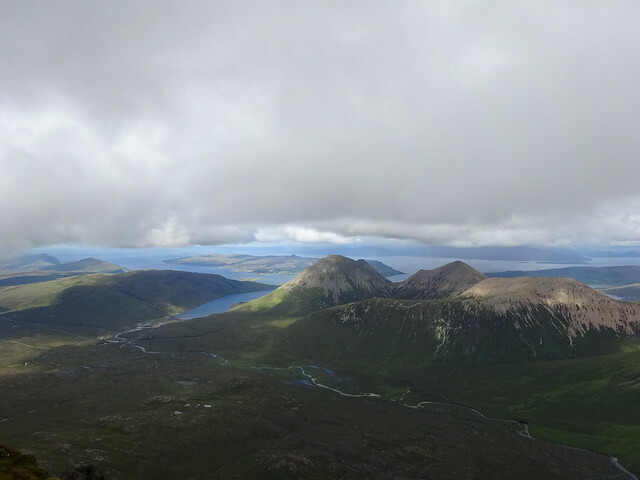 So, the Skye munros…, described in the last chapter of the SMC hillwalkers’ guide. Would that be on purpose? As I definitely didn’t want to leave them till last, I would have to pluck up the courage sooner rather than later. And this August the time had come. 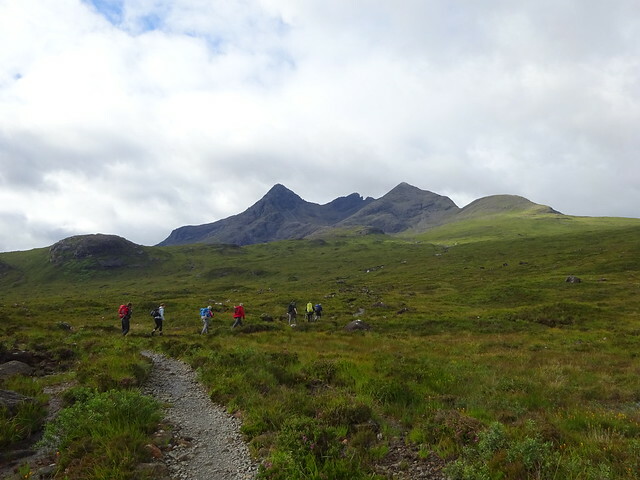 Being a walker, not a scrambler or climber, and unfamiliar with the Cuillins there was no doubt I was going to go as part of a guided group. 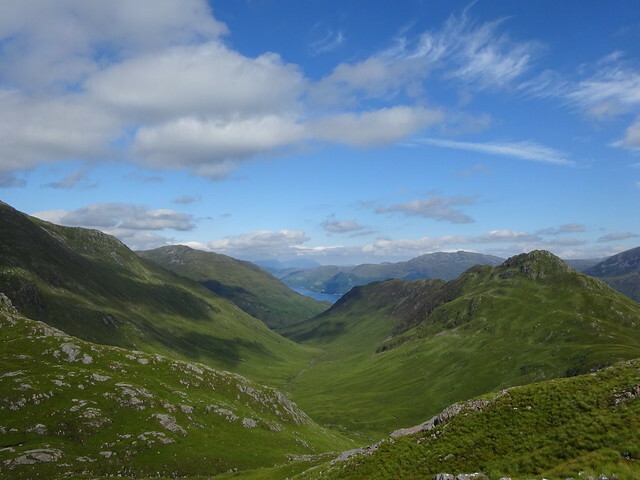 I enquired with several guides about their munro courses, booked the course date that suited me best and then started reading reports on WalkHighlands. The pictures did not do much for my peace of mind! Weather forecast checking became an obsession in the week leading up to the trip. A lot of cloud was promised. Maybe that was a good thing! Some appetizers from the drive-up, before the weather would change for the next few days, more in accordance with the forecast. We met our guide Richard ‘Paddy’ McGuire (http://www.blavenguiding.co.uk) at Glenbrittle SYHA. This was very convenient for me, as I was staying at the youth hostel. 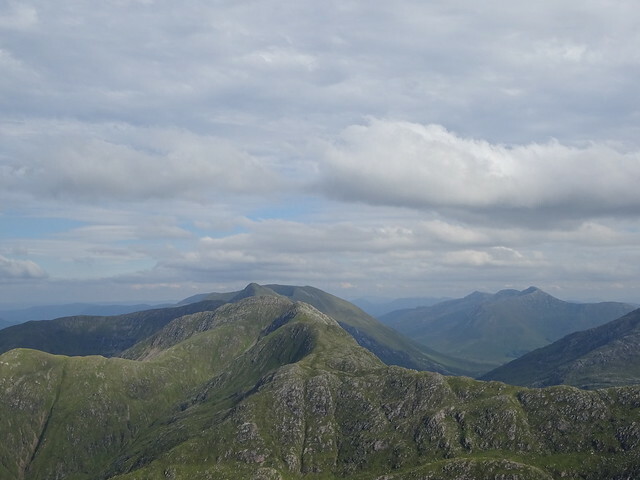 I could get used to just walking out of the door for a munro! Our group consisted of Ann, Chris, George, George and me. Only George and George knew each other. Introductions were made, equipment distributed and off we went on the excellent path, past the impressive waterfall along the Allt a’ Choire Ghreadaidh. Soon the wind picked up and the rain set in. With it any chance of keeping track of where we were, let alone identifying any hills later on went out of the window. It was a matter of follow the man at the front. As we approached the screes we stopped to put on helmets and then it was steep zigzags uphill. 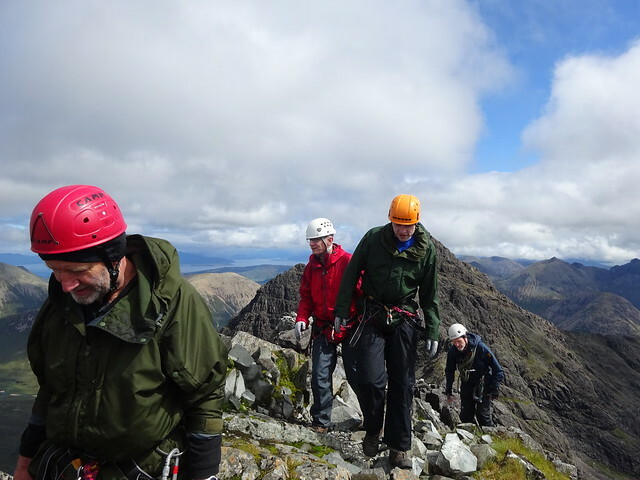 For a while we kept the craggy wall of Sgurr Eadar da Choire to our immediate right. Until Paddy pointed to a big boulder with two distinct lichen spots, the sign to leave the wall and veer off to the left for An Dorus. Miss the turning and you might find yourself heading for Eag Dubh instead. Just below An Dorus we left the bags, put on the belts, traversed a short distance to the NNW and then scrambled to the first munro of the day, Sgurr a’ Mhadaidh. 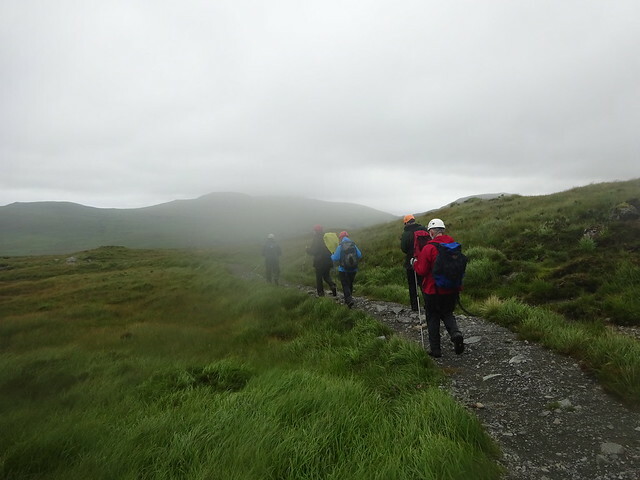 Once back at the base of An Dorus we had a short break to give another group a head start towards Sgurr a’ Ghreadaidh and right on cue the mist shifted to give a view down the corrie towards Glen Brittle. The scramble up An Dorus was fun and easy. Then we had a short climb out of the gap for which Paddy roped us up. 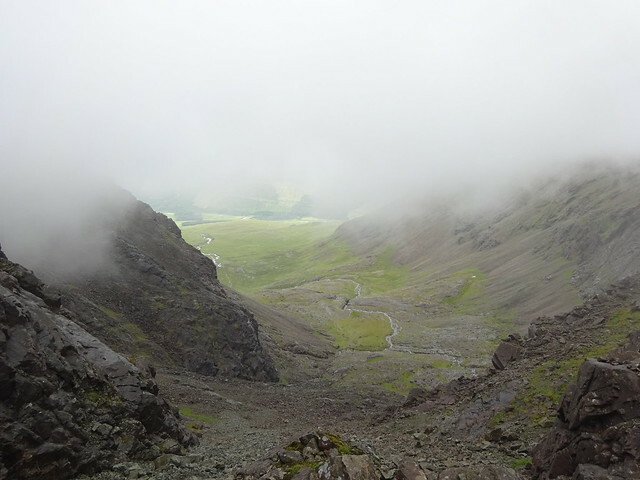 The cloud shifted once more to reveal Loch Coruisk, but I was too slow with the camera. We shuffled along a narrow ledge and stopped briefly at Eag Dubh. 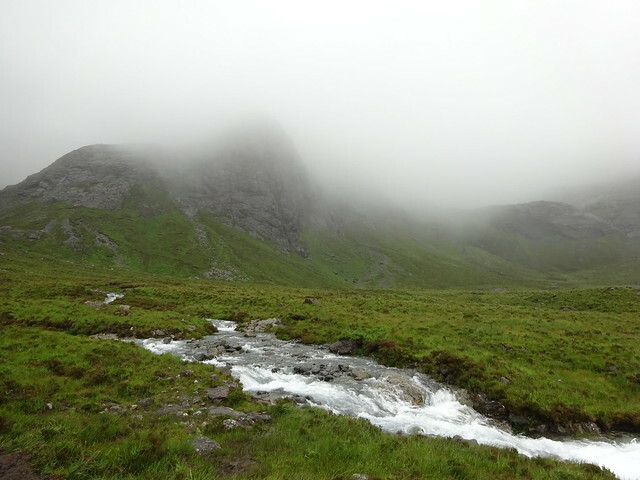 Paddy told us that in poor visibility some people scramble up Eag Dubh, thinking that it is An Dorus. The start of confusion and possibly more mistakes. 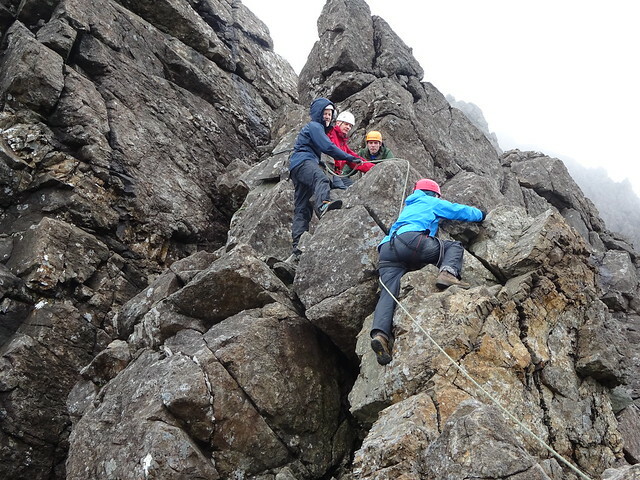 As we continued Paddy pointed out footholds and handholds and assisted where needed. 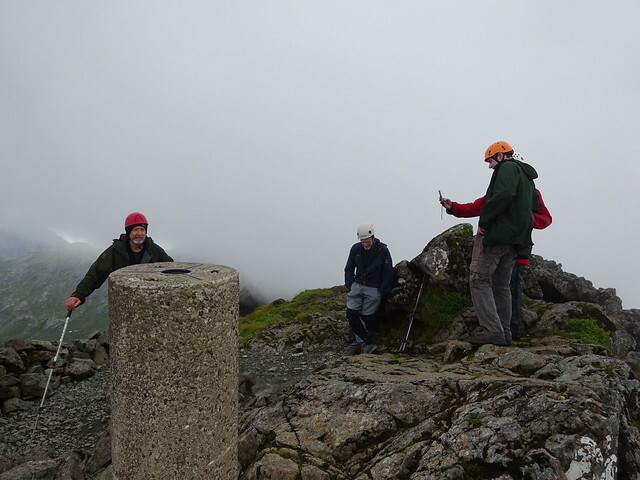 A bit further we caught up with the group ahead of us, had a short chat and soon after reached Sgurr a’ Ghreadaidh. 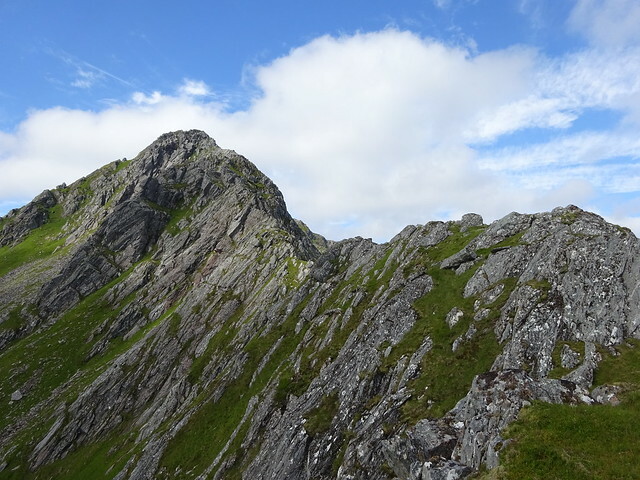 We wouldn’t continue to Sgurr na Banachdich because the wind was too strong for tackling the narrow connecting ridge. 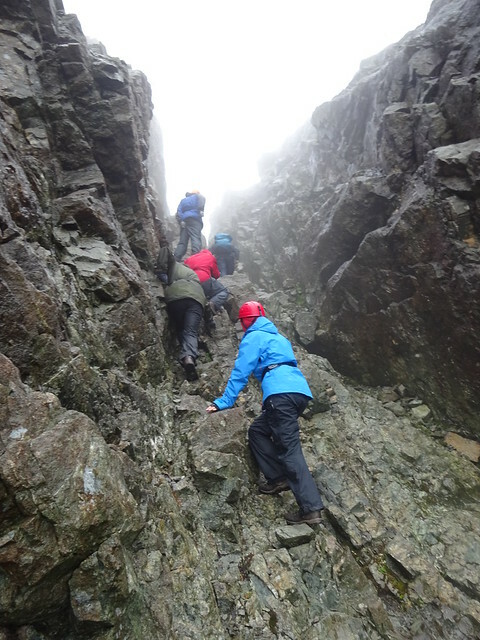 The down climb to the gap of An Dorus was a bit trickier as you couldn’t see the footholds. But with being roped up and Paddy telling us where to put our feet, all was good. And then it was the same way back as we had come up. 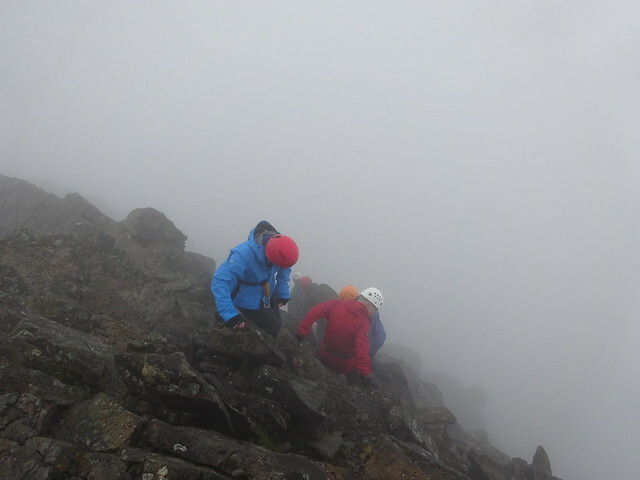 What a great day, I just loved the scrambling! There had been no need for all that pre-trip apprehension. 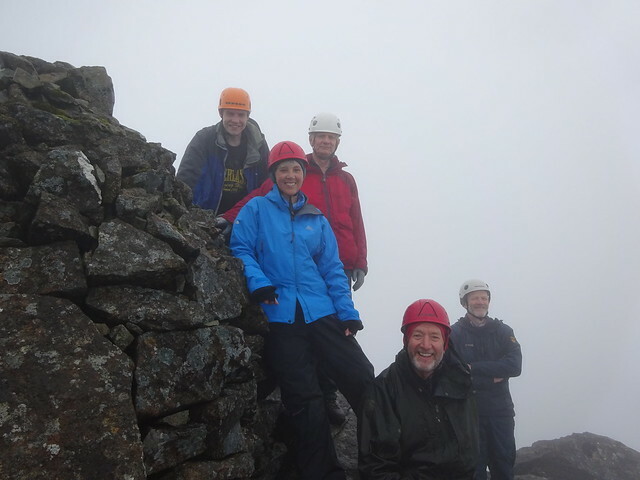 Today we were again meeting at Glenbrittle SYHA, this time for Sgurr na Banachdich. From the outset the wind was quite brisk and it remained to be seen whether we would be able to bag anything. We took the same path as yesterday, along the Allt a’ Choire Ghreadaidh. 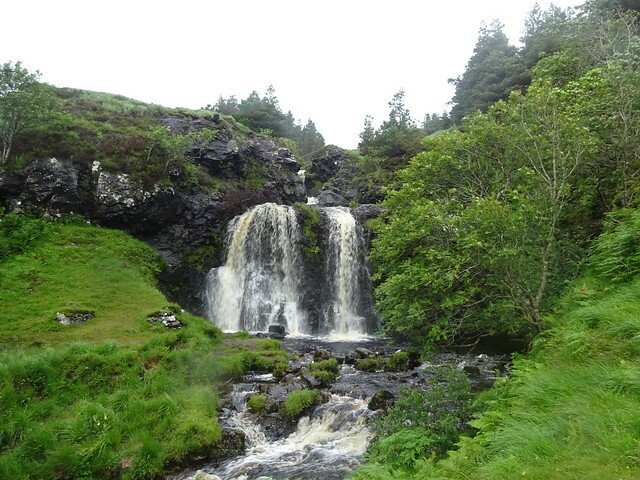 There had been a lot of overnight rain, so the waterfall was roaring mightily. After a bit more than a mile we took a right turn following the Allt Coir’ an Eich. We hadn’t walked all that far when a sudden gust of wind blew one member of our group off balance. They landed painfully on their knee, but luckily were still able to walk. As things were not going to improve higher up a decision was made to turn back. A bit later on the way down another fierce gust had all group members bar one duck low. And at the waterfall water was being whipped up skywards. 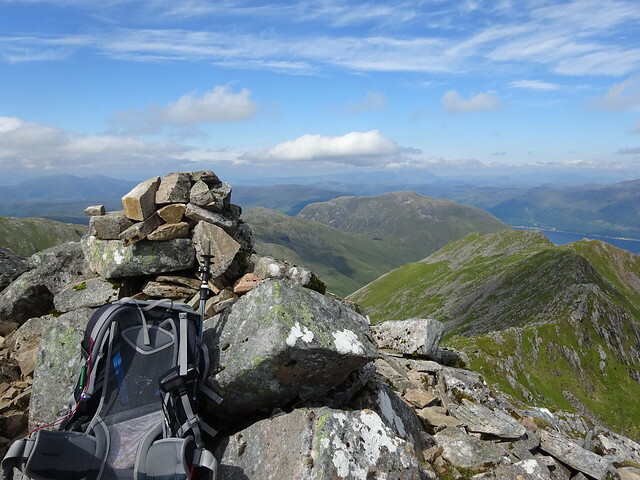 It definitely would not have been fun on top of a munro! 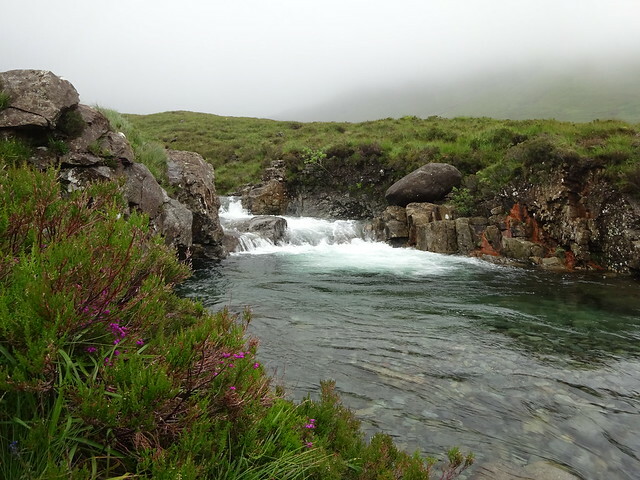 As it was only 11am when we arrived back at the start point, I had an early lunch and then decided to do a circular of the Fairy Pools, which were only a bit further up the road. A nice low level walk, so the wind shouldn’t be too much of a problem. Despite the grim weather it was incredibly busy. Hordes of walkers were making their way along the river. Today there was nothing fairylike about the water features. Raging torrents and roaring waterfalls more like! I left the masses behind and continued SE along the path, which got boggier and boggier. 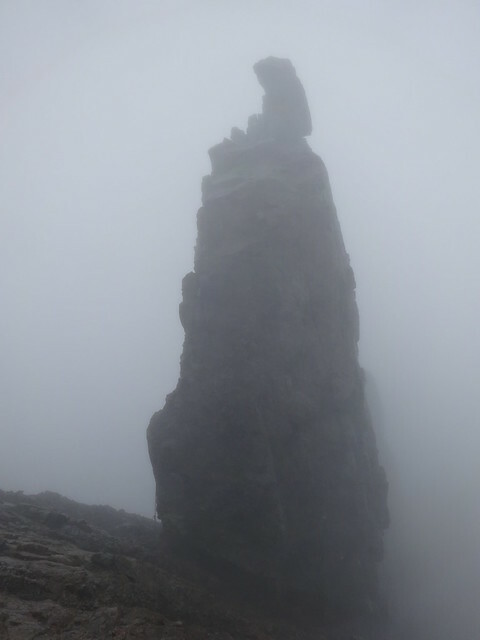 At the top of the path there was a misty foreboding view of the east face of Sgurr an Fheadain and Coir’ a’ Tairneilear. 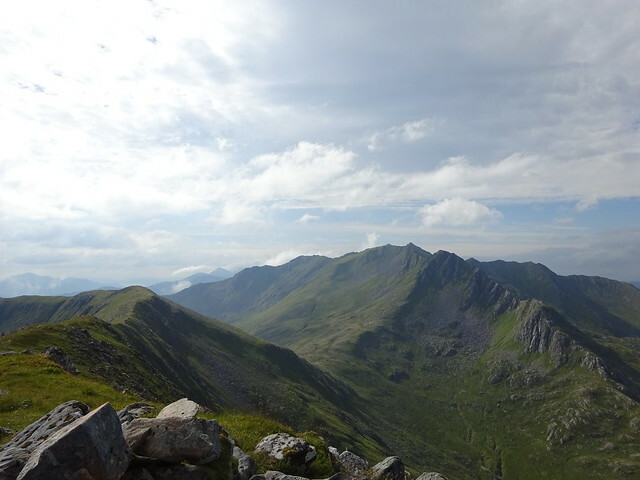 I now traversed along the lower slopes of Bruach na Frithe’s NW ridge. Visibility was poor, so I set the compass just in case I lost the path. 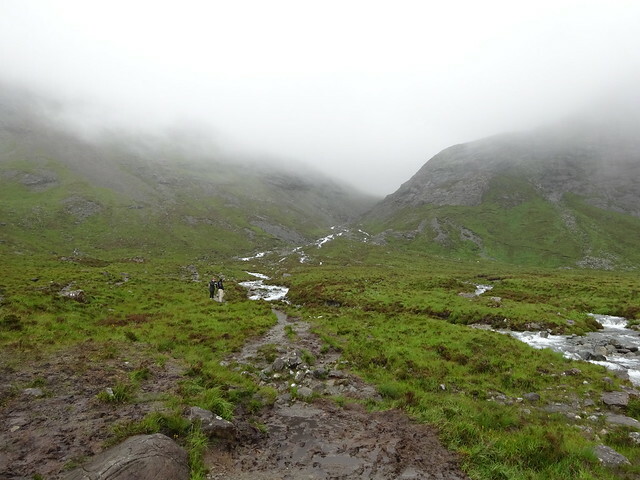 After a while I crossed the Allt a’ Mhaim and soon came across the path which leads back to Glen Brittle. 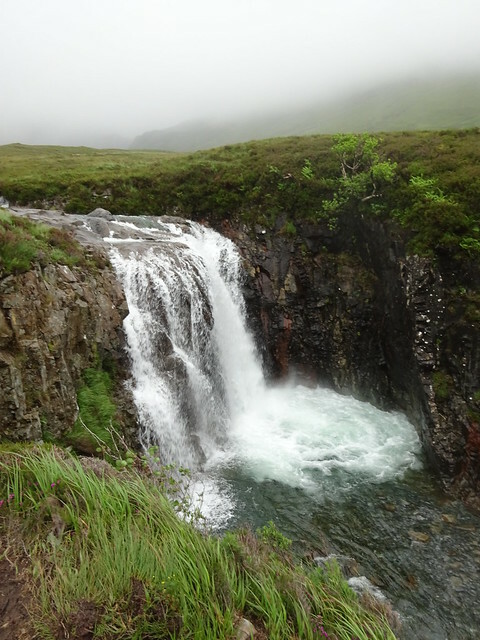 Just before the road there is a very fine waterfall, probably missed by most who walk to the Fairy Pools. Very impressive, if not more impressive than those at the Fairy Pools. A nice wee leg stretcher this walk. 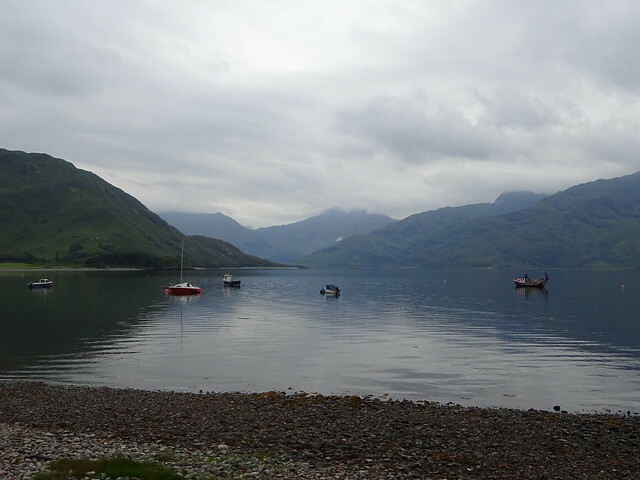 Today we were meeting at the car park just before the campsite at Glen Brittle. It was raining from the start, but on the upside there was not that much wind. We were going for Sgurr nan Eag and Sgurr Dubh Mor and maybe Sgurr Alasdair, depending on how we got on. The walk in was a bit of a blur. With the rain and mist there was not much to see. Head down and plod on. We had a break at Loch Coir’ a’ Ghrunnda and Paddy showed on a map the route ahead and the one we’d come up. 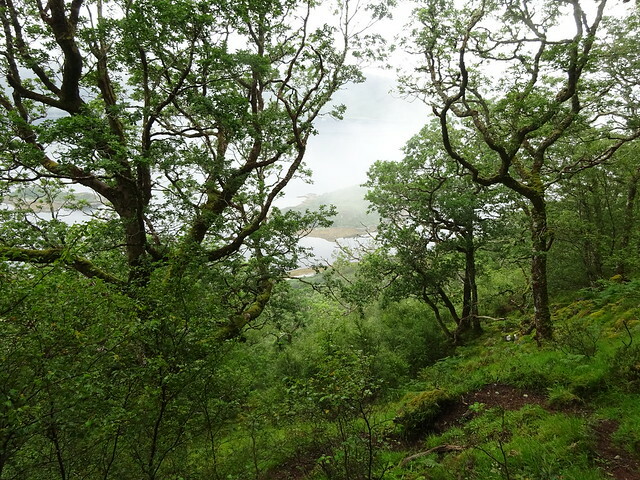 Apparently we had skirted the base of Sron na Ciche, made our way up along the higher ground of Coir’ a’ Ghrunnda and passed south of the loch, from which we would be making our way up to the ridge. Loch Coir’ a’ Ghrunnda apparently! After our break we put on helmets, the belts were not required as we wouldn’t be needing a rope. A bit higher up we left the bags and started towards Sgurr nan Eag. 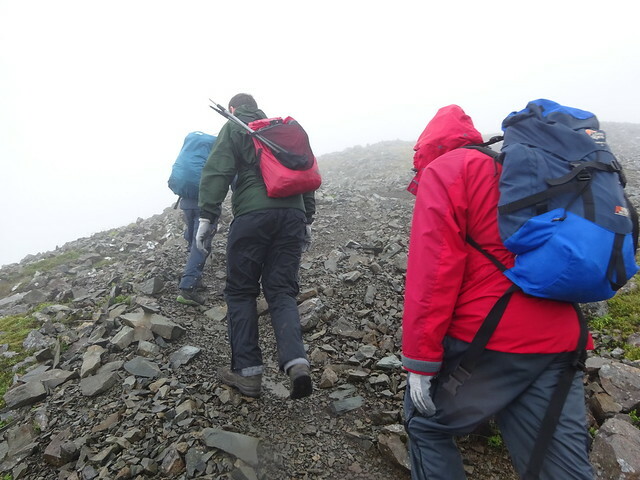 It was a relatively straightforward walk and soon we were at the summit. We made our way back the way we came, collected the bags and then Paddy picked a route to Sgurr Dubh Mor, but don’t ask me which! 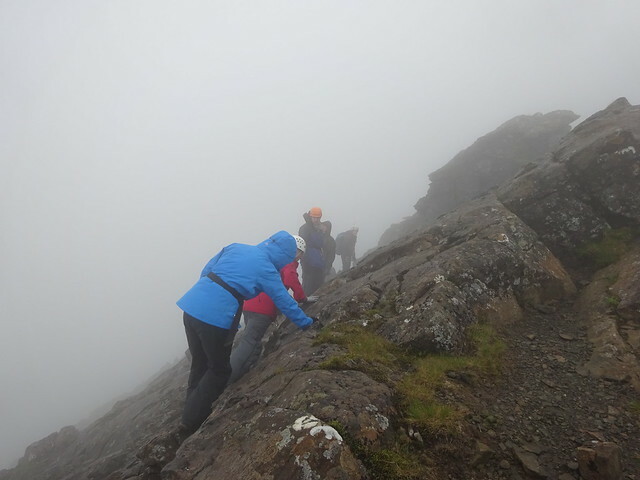 We left our bags at a convenient point, put the belts on and started an airy walk along narrow paths and ledges to the final fun scramble up the summit. The cloud had shifted a bit now, making it all even more wonderful. On the down scramble Paddy waited at tricky sections, ready to assist if needed. On the walk to Sgurr Alasdair cloud drifted in and out, giving some occasional views to Loch Coir’ a’ Ghrunnda. 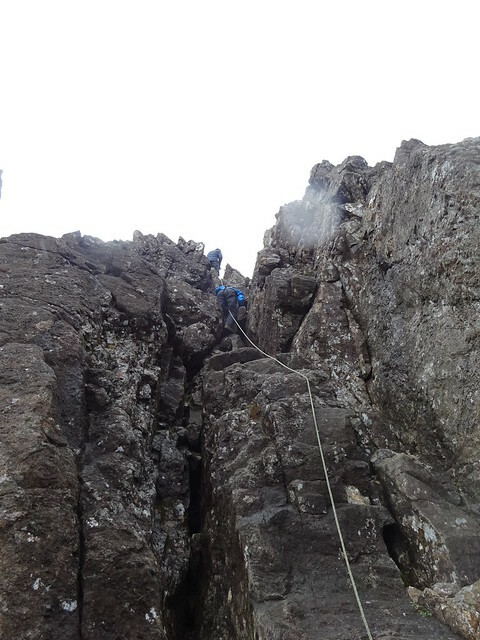 For the last part, a climb up to the ridge, all 5 of us got attached to the same rope and we climbed up together, keeping the rope above and below ourselves tight. This is quite an art. You need to watch what the people above and below you are doing and keep communicating. 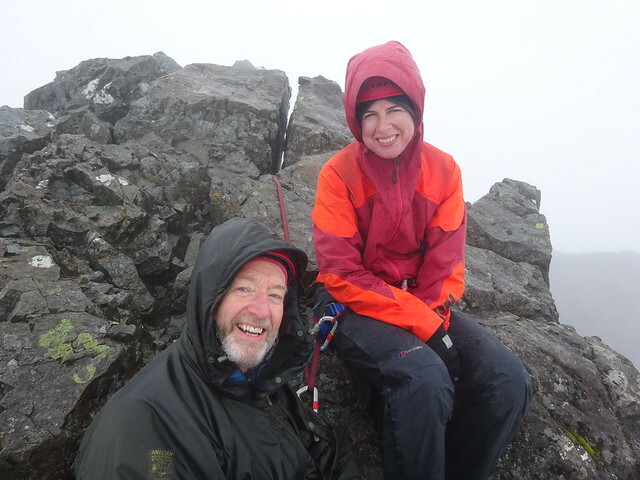 It all went well and a little later we arrived on Sgurr Alasdair, my 182th munro. 100 to go! Paddy warned for some slippery rock on the descent, but soon it was back to gabbro and a while later the ‘terra infirma’ of the Great Stone Chute. Before my trip I had seen pictures of it face on. It had looked incredibly steep and left me wondering how on earth people make it down, let alone up. But things weren’t as bad as they had seemed. Being at the back I tried to move as little scree as possible, but that was a lost battle, so scree surfing it was. Once I got the hang of it, it was good fun. I managed to stay upright for most of the time! Another great day. 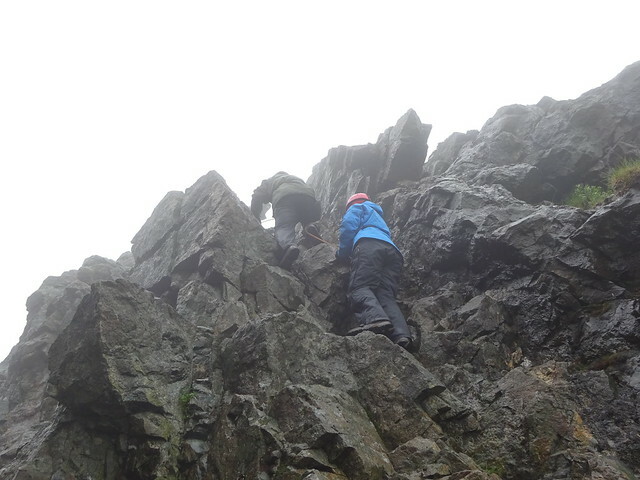 More scrambling, a bit of climbing, just fantastic! Today we met at the mountain rescue post at Sligachan. There was sun! And no wind! And MIDGES! We’d obviously turned up right in time for their breakfast. Luckily we quickly got a move on, after Paddy had distributed the equipment. Today we would be using harnesses…. The sun was baking hot and those who had put on their jackets as midge protection at the start, soon had to shed them. Sun cream was applied, some even put on sun glasses. Surely we were going to jinx the good weather now! The walk in was on a very good path with great views of today’s hills. 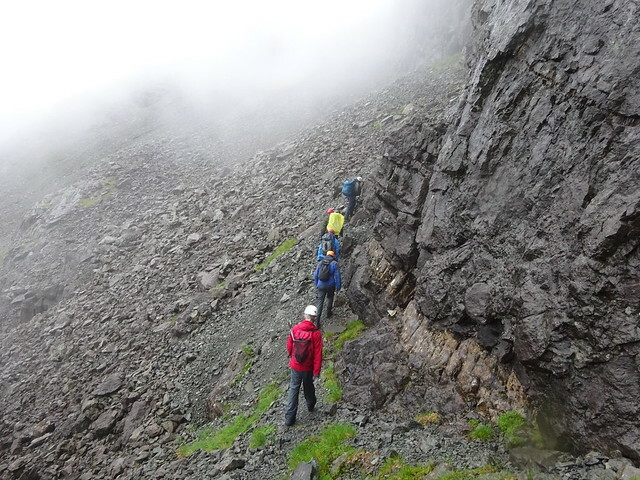 As we approached the Bhasteir Gorge the views of the Pinnacle Ridge got better and better. 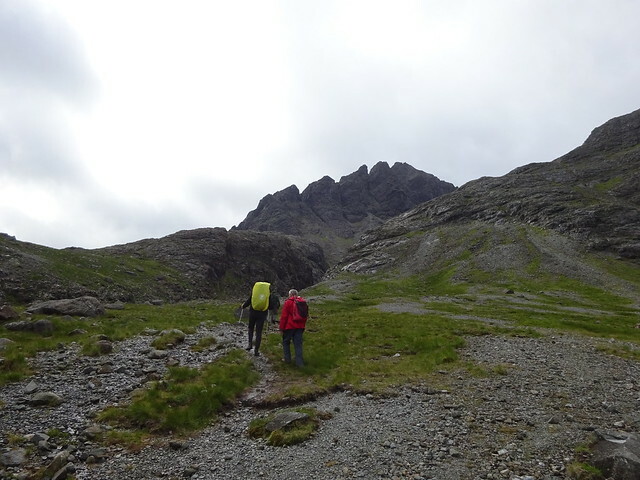 We made our way up to Coire a’ Basteir across scree and then dropped the bags, put helmets on and along a steep gravelly path below the north wall of Am Basteir zigzagged up towards Bealach na Lice and from there walked to the summit of Bruach na Frithe. Cloud was moving in, but luckily they only obscured the views to the south. On the way down it started drizzling. There you have it. It must have been the sunglasses! 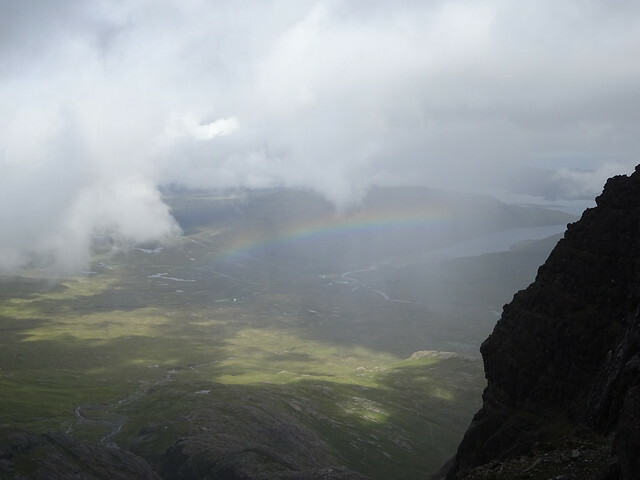 We picked up our bags and walked up to Bealach a’ Bhasteir, where we stopped for lunch and put the harnesses on. Along the ridge up to Am Basteir, while shuffling on my backside down some rock I tore my waterproof trousers. They made a loud ripping noise that you wouldn’t expect to hear in polite company. It was a neat straight cut though, perfectly repairable with some gaffer tape. At about three quarters up the ridge there was a vertical drop, down which Paddy would lower us one after the other. This was the reason for the harnesses. It was my turn. Stand on the edge, lean back, put your weight on the rope and step backwards, legs straight, feet flat on the rock. A few unladylike words escaped me, to which Paddy dryly replied that yes it does require some trust. Right. But indeed, as soon as my weight was on the rope it felt very secure and stepping backwards wasn’t too bad. After everyone had been lowered, Paddy demonstrated how it’s done without a rope. We joked that he hadn’t managed it with his hands in his pockets. And five minutes later we were on Am Basteir. On the return we climbed up the tricky section again, made our way down to the bealach, picked up the bags and then dropped down and traversed below the ridge of Sgurr nan Gillean. 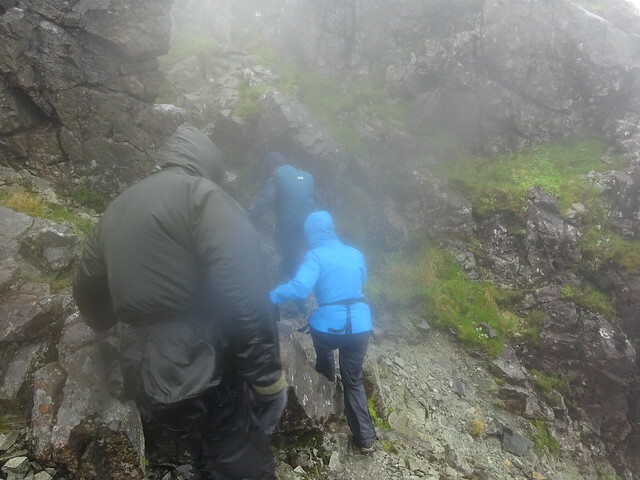 We were going to climb up a chimney on the way to the summit and were given the choice to either be lowered down a gully afterwards or descend via the tourist route. We got to a unanimous decision of being lowered, although some members of the group were quicker with their answer than others. Paddy went first to set up the pitch and called us up one by one. He then went ahead to set up the second pitch, which again we tackled one by one. This involved an airy climb, but I was too busy with handholds and footholds to notice. 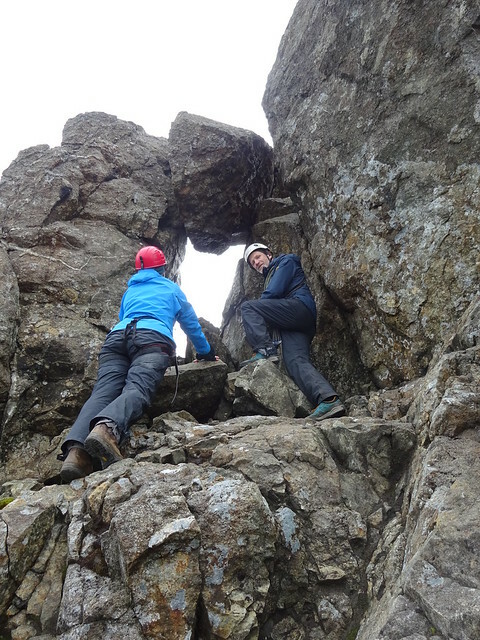 Another interesting manoeuvre around a loose rock, which would have provided an ideal handhold, but we were not to touch it! 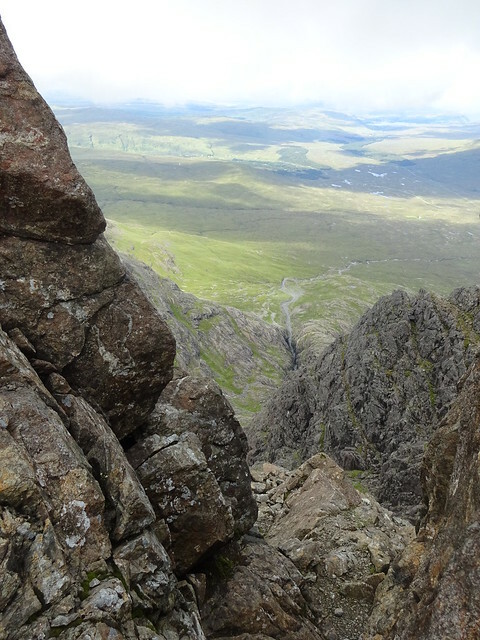 A scramble through a window and there was the summit of Sgurr nan Gillean. Brilliant, what a way to get there! Back the same way we came to the gully down which we were going to be lowered. Paddy explained which was the best route and whilst lowering us provided helpful comments: look up and follow the line of the rope, bit more to the left, approaching the narrow bit etc. I was last and having seen 4 others do it before me didn’t make any difference for my nerves. To be fair though, I found it much easier than earlier today on the way to Am Basteir. Starting to trust the rope! Once Paddy had rejoined us he said that having done this, we wouldn’t have any problems getting off the In Pinn tomorrow. (In Pinn? Tomorrow? Gulp!). 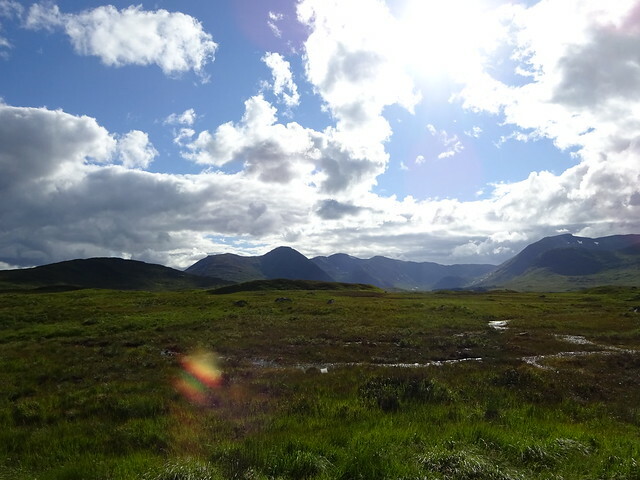 And so we made our way back to Sligachan. Visible in the far distance, but not getting any closer by for a long time. When I arrived back at the hostel in the early evening, after having stocked up on provisions in Portree, a helicopter was searching the hillside. 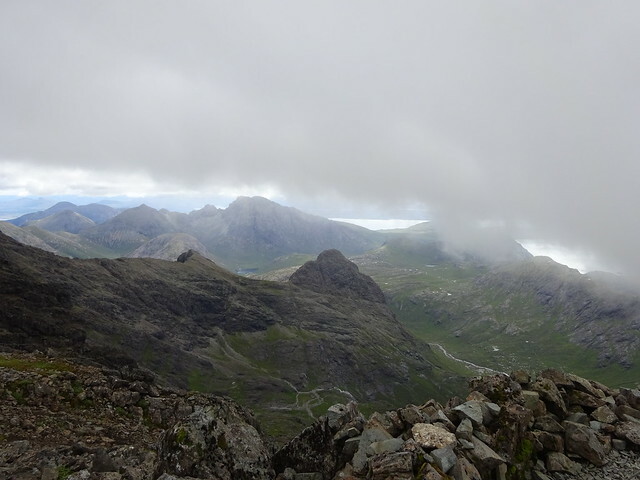 I heard from others at the hostel that a French walker had got into trouble in the Cuillin. He had phoned his wife, who had told their B&B host, who had alerted the MRT. The search was complicated by the weather, a lack of info on the area the walker was headed for originally and by it getting dark. The wife had arrived at the hostel, where luckily a few French guests could assist with interpreting. They kindly stayed up with her till 2.00am when she went back to the B&B. Her husband had not been found by then. The search for the missing walker was still in full swing when we met at the Glen Brittle Memorial Hut. 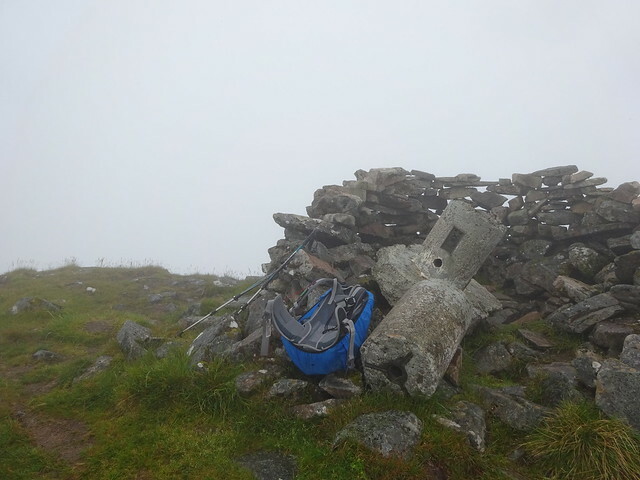 So both the walker and those looking for him had spent a night out on the mountain…. Equipment was distributed and as two ropes were needed today I offered to carry one. I got given the shorter rope, so it didn’t add that much weight. We made our way up the path and although it was dry, this didn’t last for long. 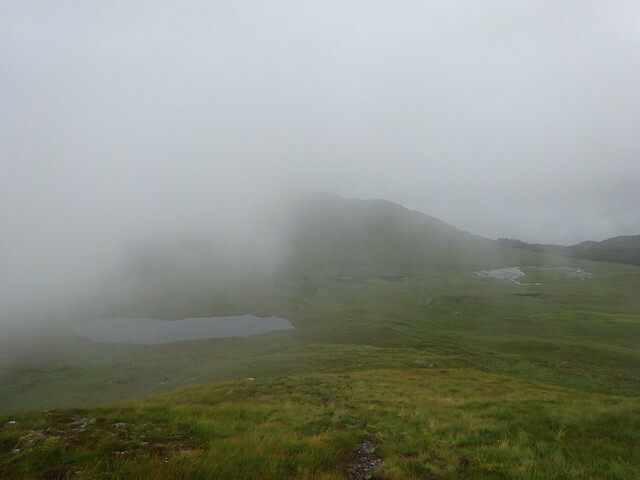 Clouds came floating in from Loch Brittle, the drizzle set in and with that visibility was poor for the rest of the day. 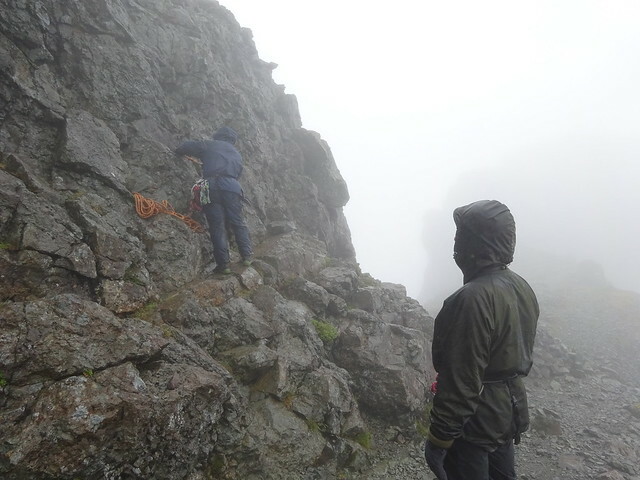 Initially the plan had been to go for Sgurr Mhic Choinnich first, but with the weather not sticking to the forecast and likely to get worse, Paddy decided to head for Sgurr Dearg when we got to the fork in the path. If I’m not mistaken we went up its west ridge. I don’t remember much from this ascent, only that the wind picked up considerably, which didn’t bode well. Head down and plod on. 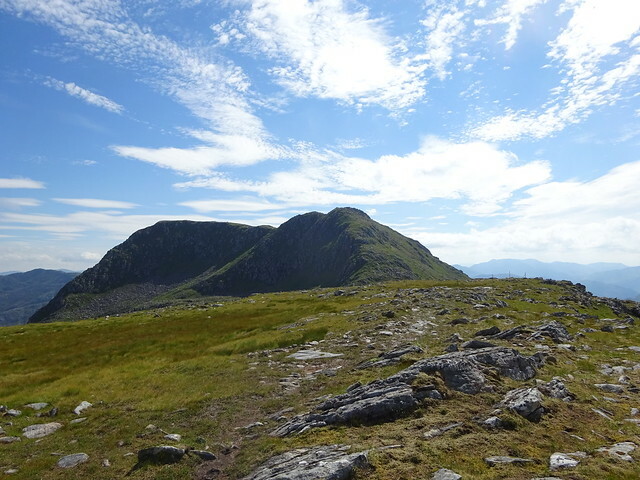 When we stopped next, we had arrived on Sgurr Dearg. There was the In Pinn! Paddy asked whether we wanted to go and have a look. Four volunteers raised their hands, number five bowed out as their boots had not coped very well with wet and slippery rock in the past few days. Helmets and harnesses were donned and also a few extra layers, as it was damn well cold now (four layers in August, where is summer?!). Paddy divided us in pairs and took the first pair (which I was in) down to the base of the east ridge of the In Pinn. 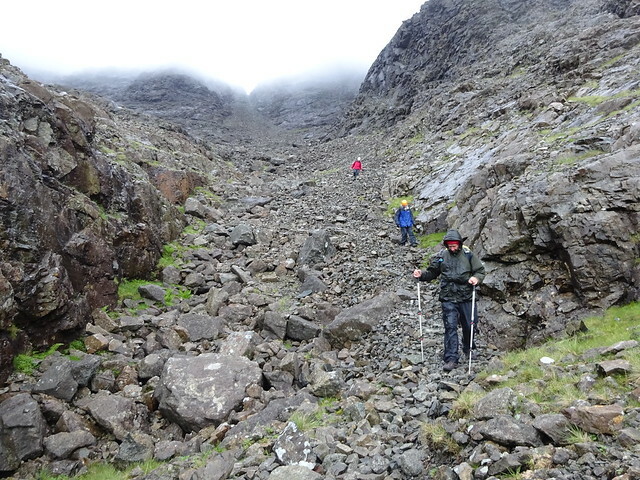 This was along a steep, slippery, slabby and scree-y slope and we had to be careful not to dislodge any rock as people might be on their way up. At the base we got attached to the rope. The two of us would be climbing together. Before he went up to check out the conditions, Paddy told us not to start climbing until he called us. 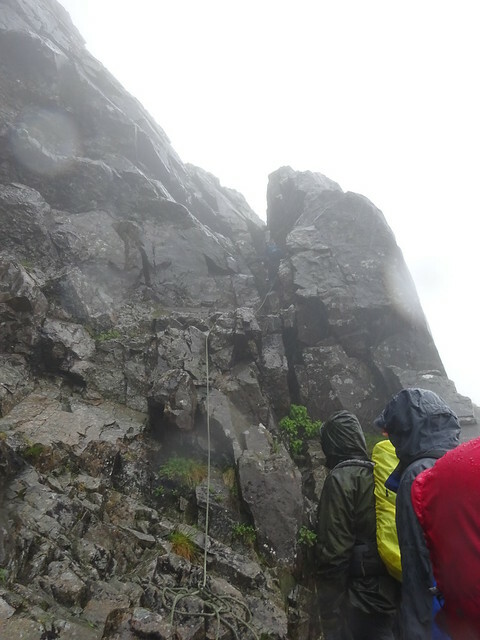 It was far from ideal with wet rock and a lot of wind and it might not be safe for us to go up. He also said to keep three points of contact at all times when climbing. And so he disappeared into the mist with the rope trailing behind him. At one point the rope came back…, but then it went up again. A shout. OK, there we go! My memories of the first climb are a bit blurred. I don’t remember finding it particularly scary, slippery or exposed. Apparently there was a crux? 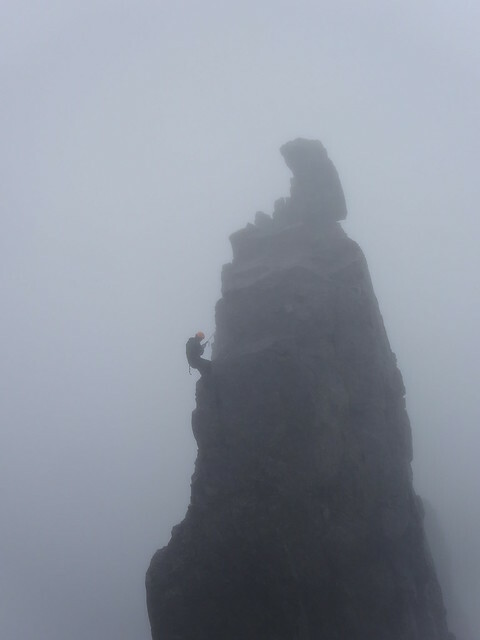 Too busy with climbing to notice and of course the mist helped too. We both got up to the first pitch. For the second part of the climb Paddy said to stick to the ‘staircase’ and to stay low as this section would be very exposed to the wind. Staying low for me was crawling up on hands and knees, which undoubtedly cost me some style-points. I can’t imagine it looked very elegant. The staircase wasn’t very wide, there was a vertical drop on the left and the wind had free play here. But this was not the place to dwell on such distractions, the only way was up! And so we both got to the top. Woohoo, well done, high five! Paddy talked us through getting off the In Pinn, where to stand, where to aim for and then lowered us one after the other. With all the practice I’d had yesterday, stepping backwards off the edge was quite OK and the walking down was fun. I’m learning! Once down, Paddy took the other two whilst we waited with the fifth group member. As it was really cold, I dug out the storm shelter from the bottom of my rucksack. It’s been living there for five years unused, but today it came in very handy. It’s officially for two people, but the three of us did fit in and soon we were warm as toast. When all were back, we once again carefully made our way down the steep slabby slope, but this time we had much further to go and it demanded a lot of concentration. 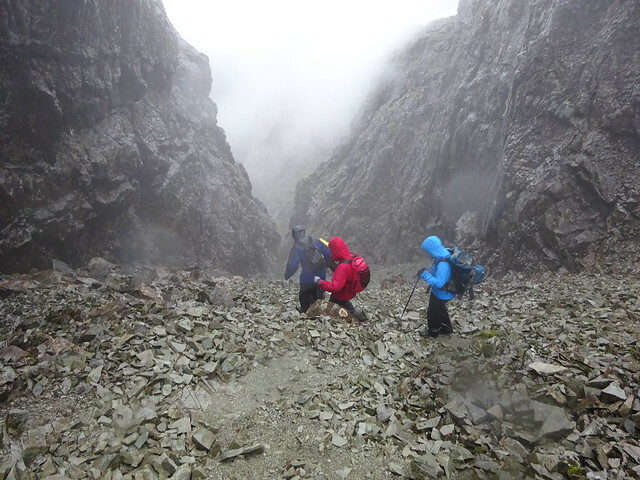 We stopped at Bealach Coire Lagan, left the bags and then started a scrambly route towards Sgurr Mhic Choinnich. Paddy showed us where to put hands and feet at trickier sections. 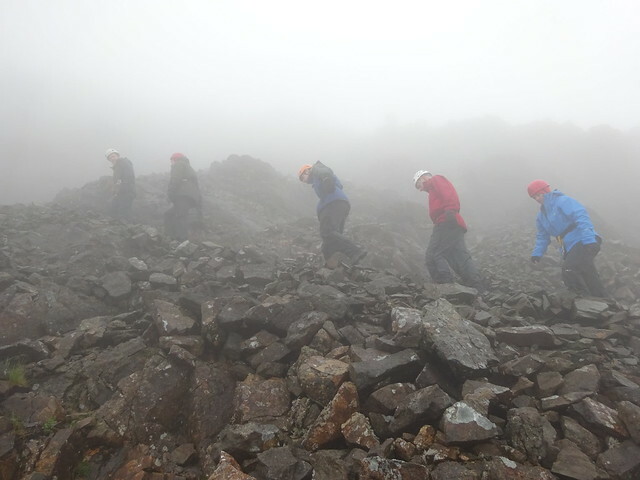 The scrambling lasted much longer than what we had done so far and again a lot of concentration was needed. Good fun though. A quick picture at the summit and down we went. It was still cold, wet and windy, so no point in loitering. Throughout the day we had heard updates via Paddy’s radio on how the search for the missing walker was progressing. 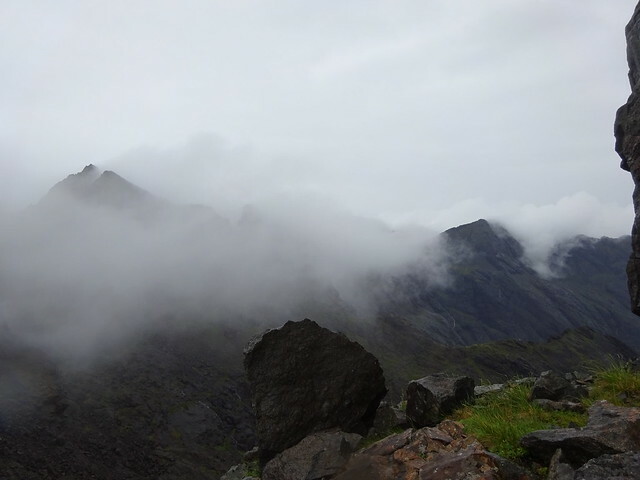 On the way down from Sgurr Mhic Choinnich we heard that he had been found alive near Loch Coruisk. Excellent news! I later read that he had been walking in the An Dorus area and had broken his wrist. 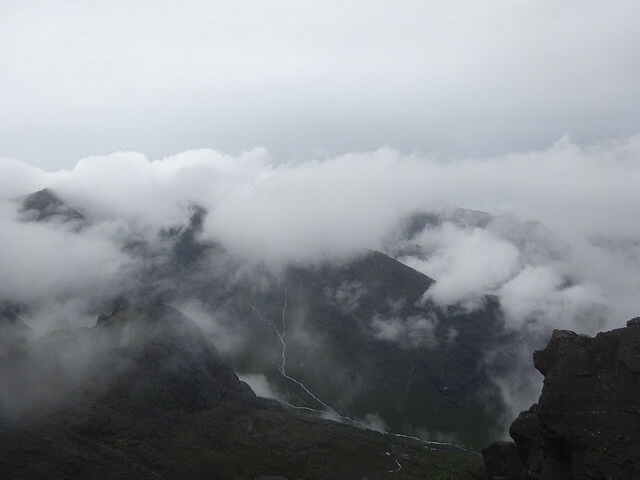 The search had lasted 24 hours and involved the Skye and RAF MRT’s, the coastguard and the Search and Rescue Dogs Association. It really brings home the amazing job they do. Once back at the bags we had a short food break before surfing down the An Stac screes into Coire Lagan. And then it was a walk along the path back to the memorial hut. What a brilliant five days! I didn’t know beforehand that I would enjoy scrambling and climbing so much. 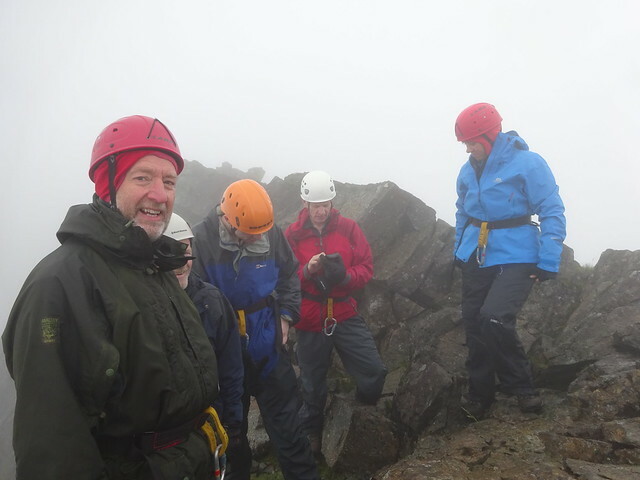 I never felt out of my depth and with Paddy’s calm and reassuring way of guiding, I was more than happy to give things I’d never done before a go. Thank you to all for the great company and conversations! This trip was an experience I won’t forget for a long time and I can’t wait to return. 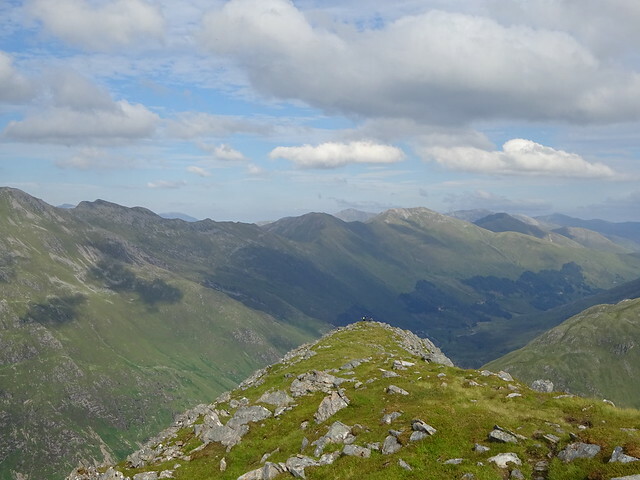 The original plan for today had been either the south or north Glen Shiel ridge. But for various reasons a big day didn’t seem such a good idea anymore in the morning: arriving late the previous evening, skipping dinner, sleeping in. 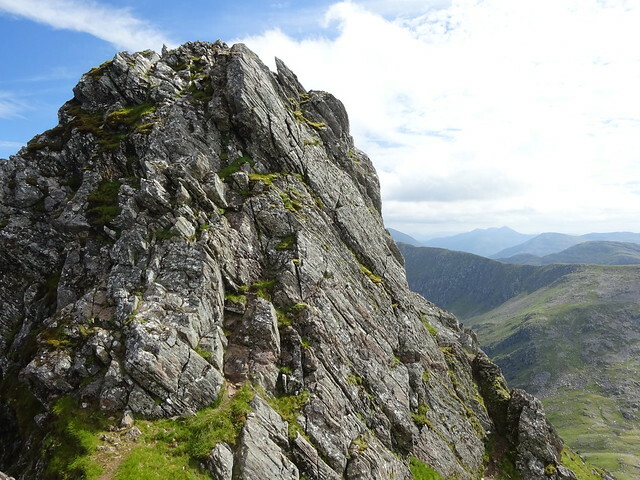 So instead I decided to feed my newly discovered appetite for scrambling with an ascent of The Saddle via Forcan Ridge. 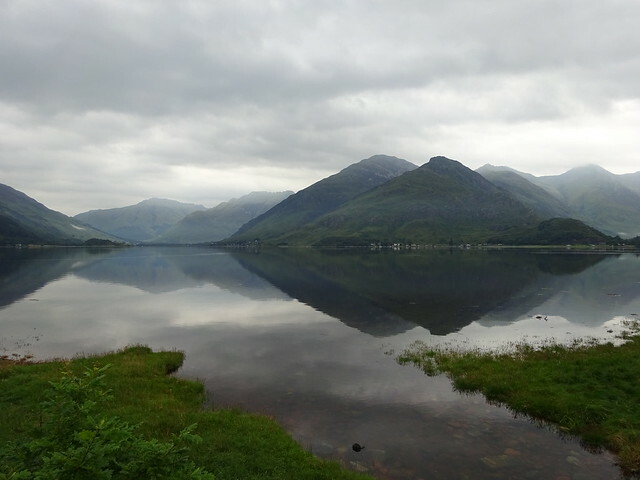 I parked in a layby on the A87, crossed the road and started along the path. Half way along it got very boggy and it became apparent that a better start would have been to follow the road east for a short distance and then take the proper path. Once over the fence the path is very good and although not overly steep it doesn’t waste time to gain height. It was a lovely sunny morning and soon the sweat started pouring. I caught up with two walkers ahead of me and we had quite a long chat. 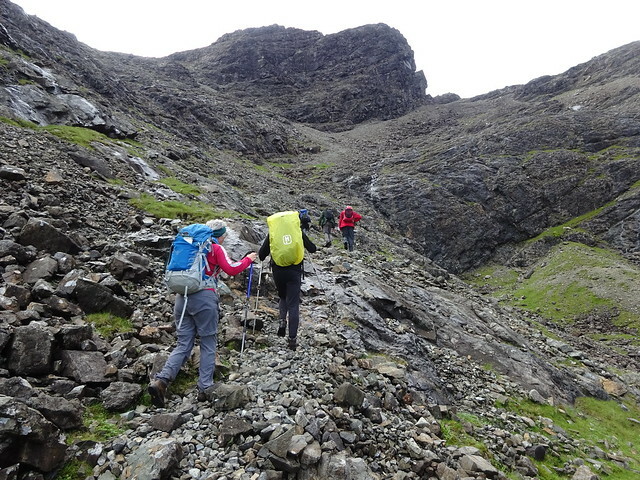 They were also heading for The Saddle but were going via Bealach Coire Mhalagain, bypassing Forcan Ridge. From the bealach below Meallan Odhar the ridge didn’t look too bad, but it really was too far away to judge this properly. 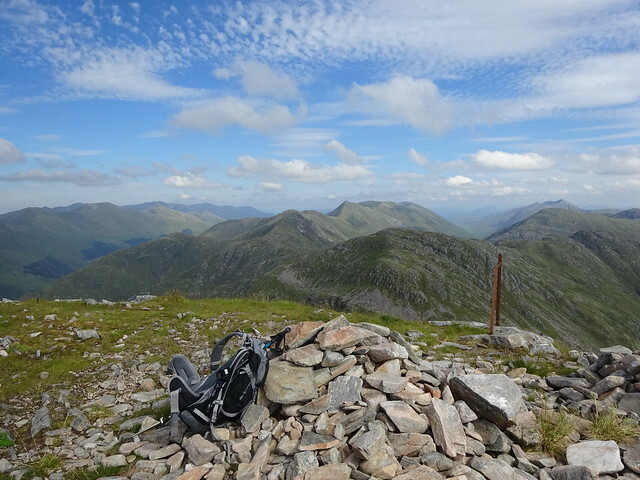 I stopped for some food at the base of Forcan Ridge and enjoyed the views. It was good to be back. 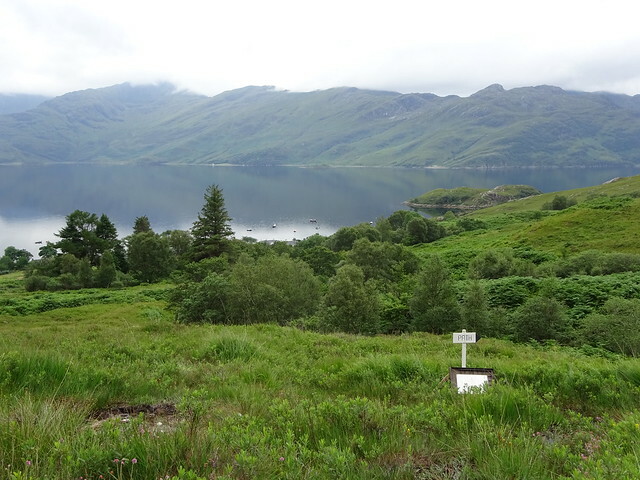 When I did the Cape Wrath Trail, I had enjoyed the same views from this spot. I remember being in awe. Well, that hadn’t changed! On to the scrambly bits. 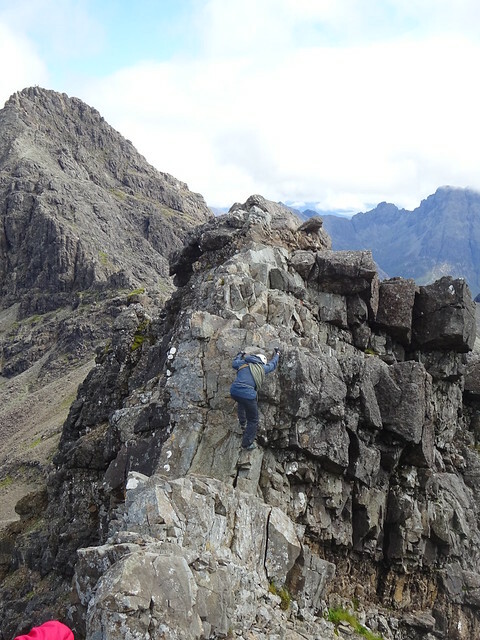 I must say that spending 5 days in the Cuillin hills has definitely opened my eyes for what makes a handhold and foothold. 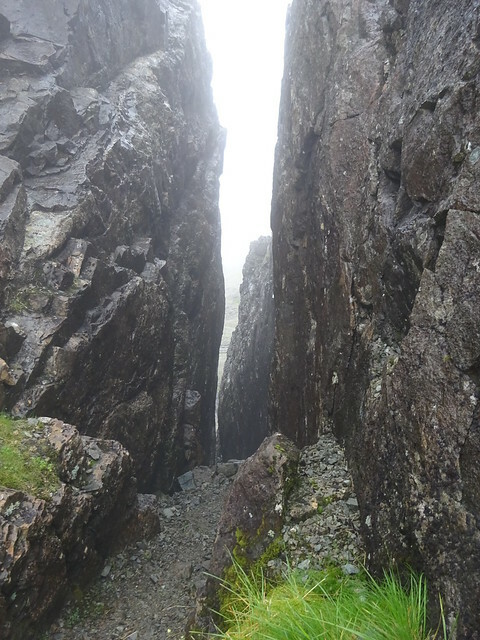 So I happily dug the noses of my boots into cracks in the rock and started the scramble up and enjoyed it very much. I avoided sections where it was unclear where the scramble went or ended, including the steep drop after Sgurr na Forcan. Here I went down a steep eroded slope on the left and then down a gully. At the base of Sgurr na Forcan the climb up didn’t look too bad. I will have to return to try that another time. From here the route to the Saddle was straightforward. I had lunch at the trig point, as there was a bit more space to sit and take in the views. The walk down to Bealach Coire Mhalagain went smoothly. I caught up again with one of the two walkers I had met in the morning. 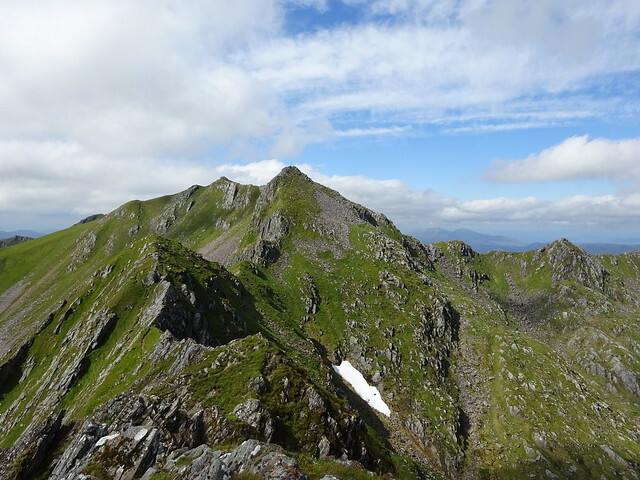 He was waiting for his friend who had gone on to Sgurr na Sgine, after which both would walk to the Saddle. Had another good chat. 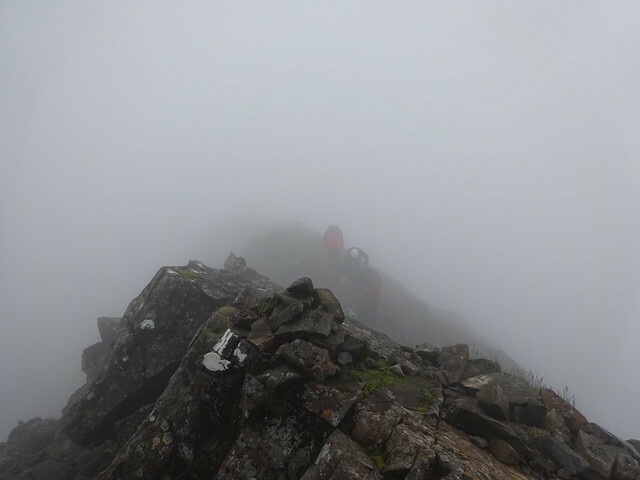 The path up to the ridge of Sgurr na Sgine is a bit hit and miss, but I managed to stick to it. Once on the ridge the views back were magnificent. 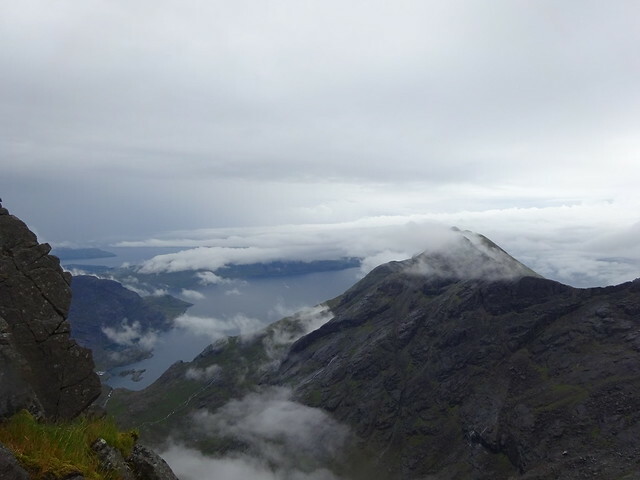 Now it was a relatively straightforward walk up the rocky north west top of Sgurr na Sgine. On the way I met two other walkers, which I recognised from the youth hostel. 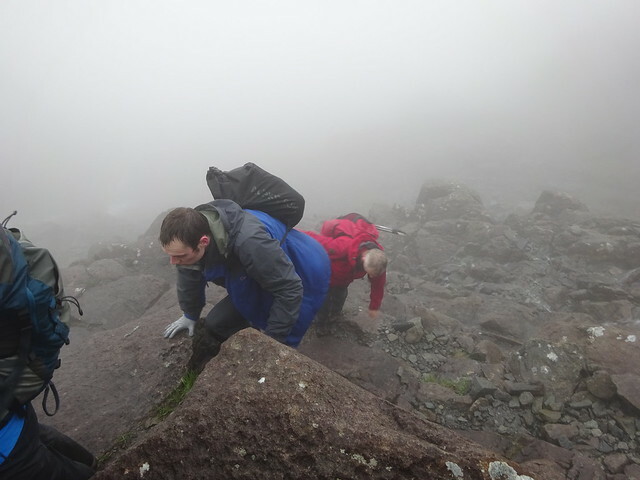 They had also scrambled up Forcan Ridge but had climbed down the steep drop after Sgurr na Forcan. They said it had almost killed them. 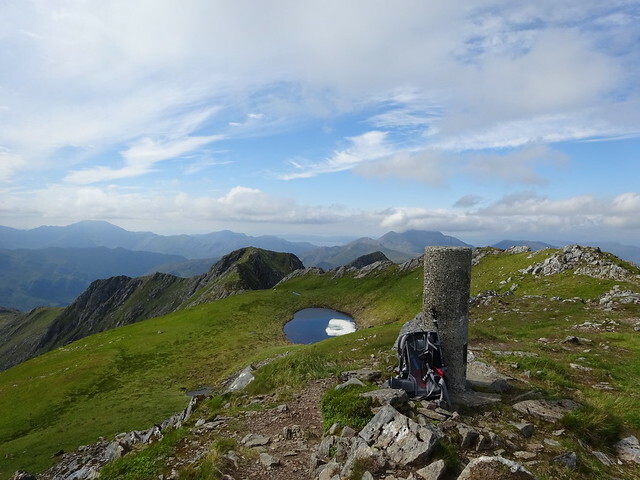 The summit of Sgurr na Sgine is of modest stature, but this was compensated by the splendid views of the south Glen Shiel ridge, Forcan Ridge and the Saddle, Beinn Sgritheall and Knoydart. And what a lovely day for walking it was! My return route was via Faochag, staying high so I could enjoy the views for as long as possible. The price, a seemingly never ending steep descent, was well worth it. Must admit though I was running out of steam here. Glad to have decided on a shorter day! At the foot of Faochag it was rather boggy but the Allt Mhalagain was quickly crossed thanks to some well placed big boulders. 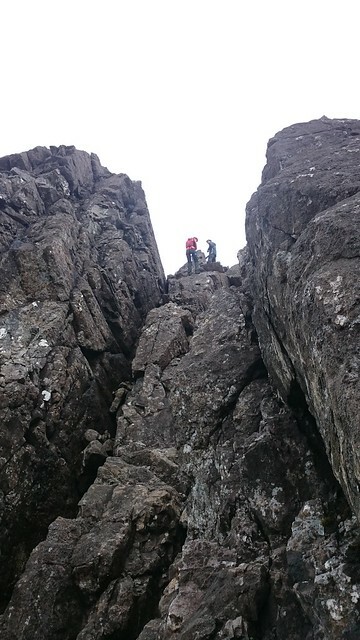 A most satisfying day with a fun foray into scrambling on my own. A short trip was in order as I was making a start with the homeward journey today. 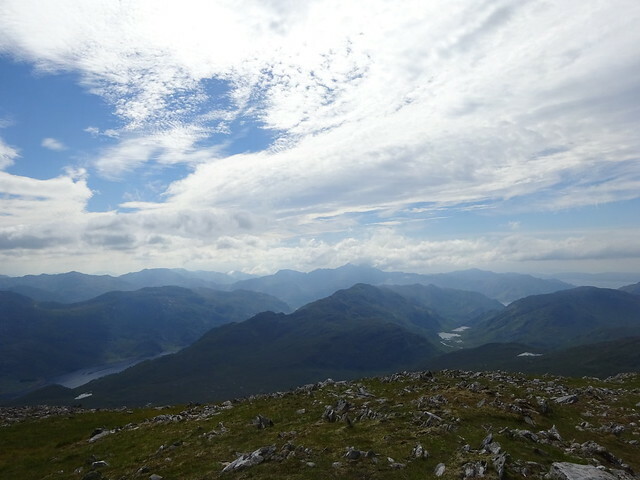 So Beinn Sgritheall it was, an ideal hill to sneak in before the fabulous week would end. I think the weather was shocked to have produced such a lovely day yesterday, because today it was back to its good old dank self. 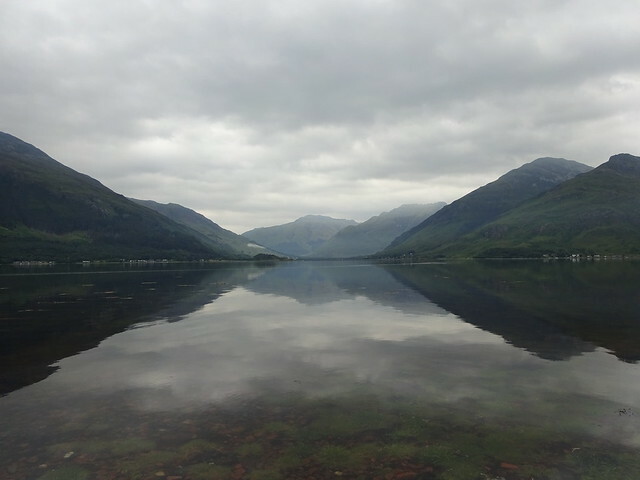 Nonetheless, the early morning views of Loch Duich were magnificent with the hills’ reflections on the water. 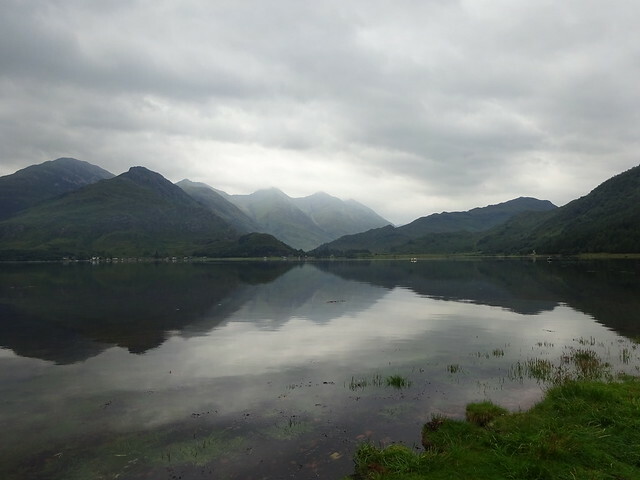 The drive from Ratagan to Arnisdale took a good hour. 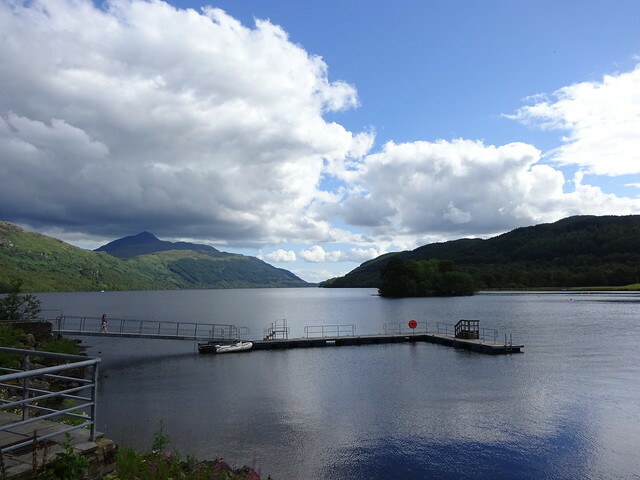 More lovely lochside views there. The start of the path is signposted from the road. The walk round the back of the village wasn’t as boggy as expected. The steepness, which came later, was exactly as expected. Bealach Arnasdail provided a short respite. Then more steepness. 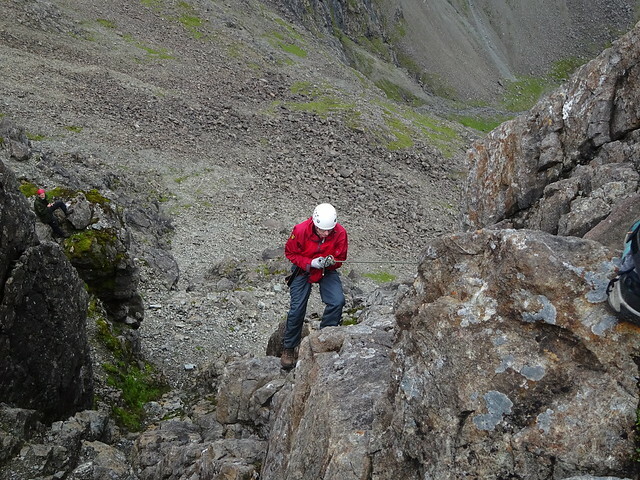 It was quite fun picking the best route up the scree. But it was also good to arrive at the 906 top. Time for some food. 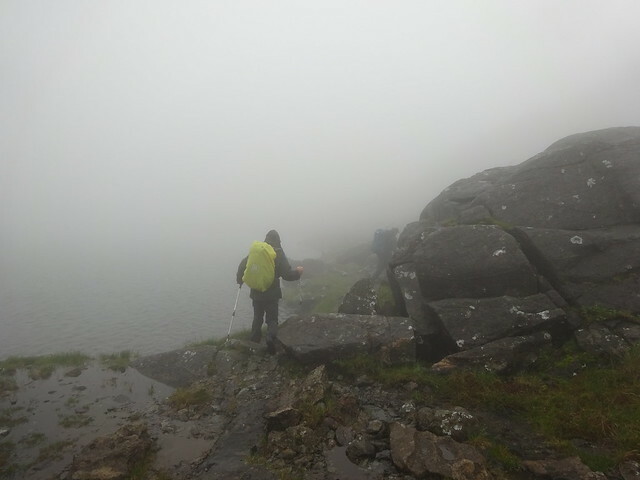 A compass bearing was needed to get down in the correct direction as the mist was quite thick. 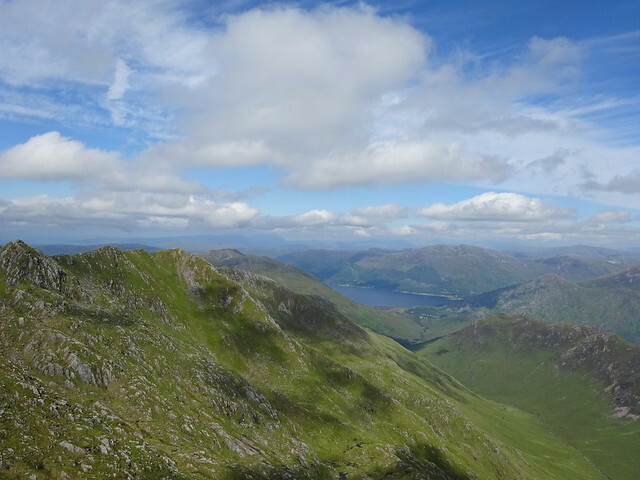 Apparently, after the bealach the ridge was narrow and airy with great views towards Knoydart. Sure. Soon after, the summit was reached but there was not much incentive to stay for long. No views towards Skye. 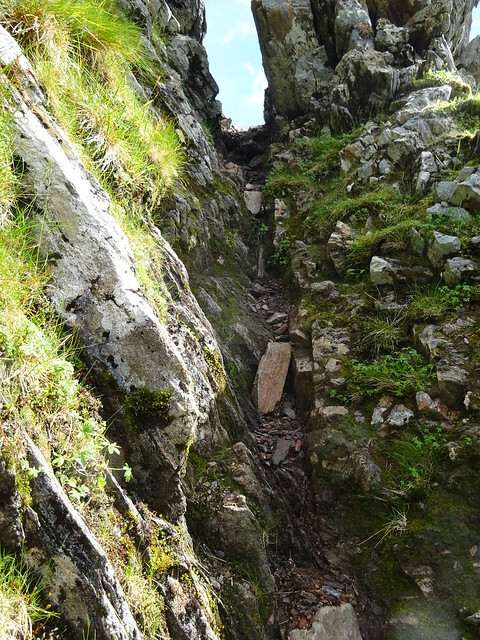 Another compass bearing for the general direction of the descent, which initially was steep, rocky and slippery. Lower down the slopes got grassier and progress easier. 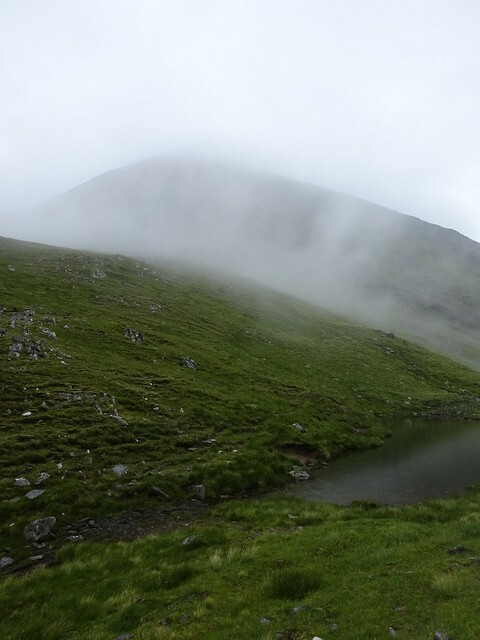 There was the lochan, the cue to start heading south and descend down Coille Mhialairigh. 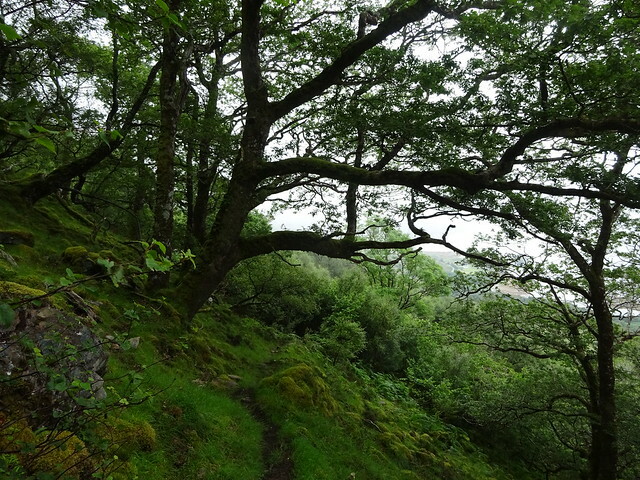 The path clings to the hillside as it weaves its way through lots of young trees. It was a wet affair today, though very refreshing in the muggy conditions. There were some really slippery steep bits, but with plenty of trees at hand to hold on to it wasn’t too bad. 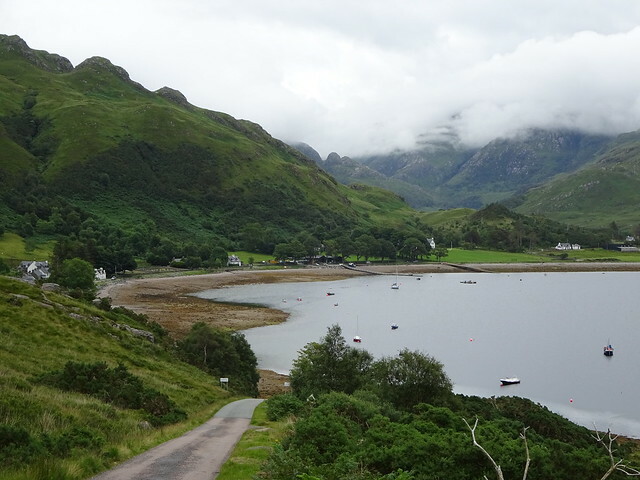 And then it was just a pleasant stroll on tarmac back to Arnisdale. The end of a great holiday and the start of a long wait until my next trip. Last edited by Silverhill on Mon Oct 12, 2015 7:55 pm, edited 7 times in total. Superb stuff, off to read it again. Cracking photographs, pity about the low cloud. Brilliant report and photos of your week Silverhill. Superb outings there SH and the images really help amplify the experience for the reader. You'll be back for the wee drop on the saddle and hopefully some clear views on the rocky cool ones too..
What a week despite the sometimes iffy weather. As one who returned to Skye again and again and only did it in bits, your week sounds like really hard work, specially in the sometime rain. Good for you for packing in a course like that. 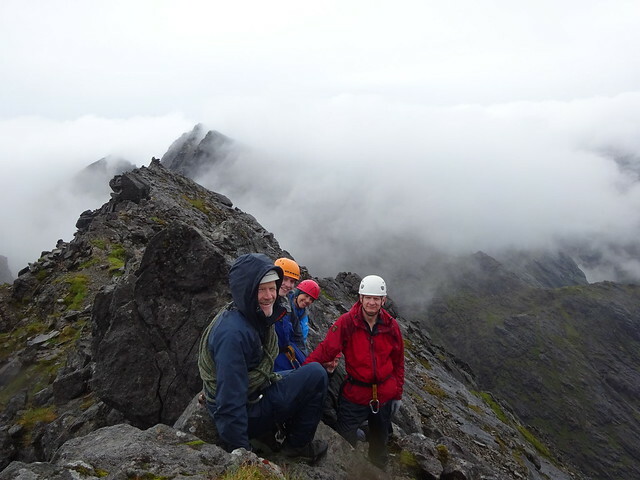 All reports I have read about the Cuillin make it clear that the guides there are great at giving folk confidence. Husband had already done all but the Inn Pin with a friend when in his thirties, but was rather less sure about taking me (then early '60s) round some of the harder ones, so we got Mike Lates for a day consisting of Inn Pin, McCoinnnich and Alasdair and a year later for Bruach na Frithe, Am Basteir and Gillean. 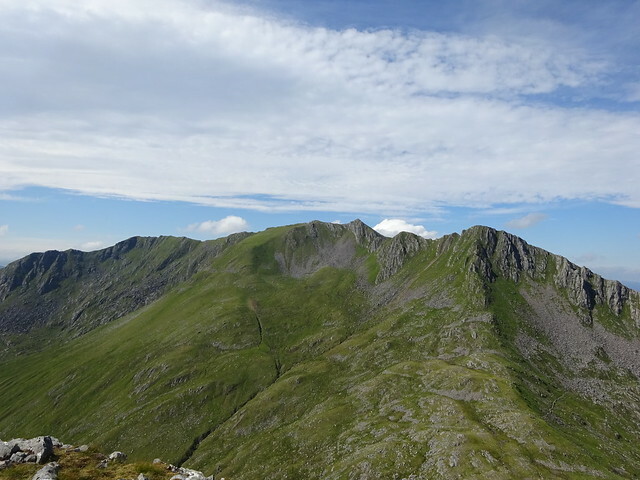 Like you, (but leaving a week or two) I then felt fine to tackle the Forcan Ridge. It's all easy cruising for you now......well, almost. See you still have the Fisherfield, but that is logistics rather than scariness. 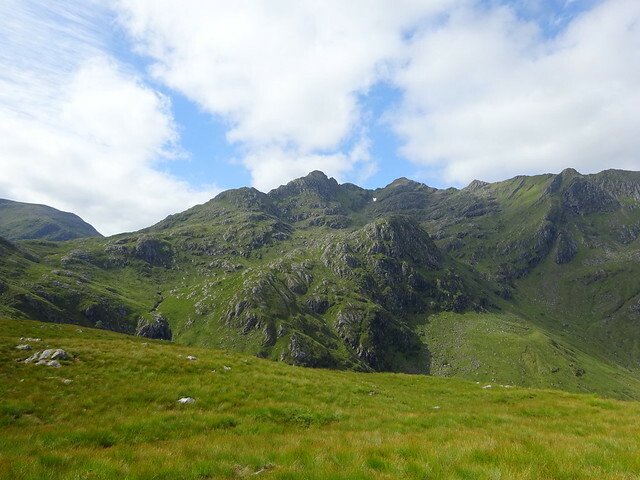 We've been toying with the idea of doing the Skye munros for a while now and reports like yours give us the nudge to get on with it. Thanks for a great report Silverhill, it looks like a fantastic experience. Great report of an exciting week - you really packed 'em in there! 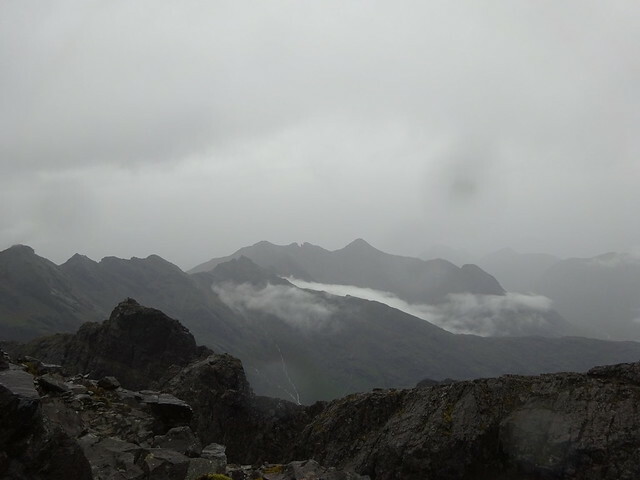 It's a pity you had so much mist and rain in the Cuillin, but at least it cleared at times, if only briefly, to reveal some impressive views. 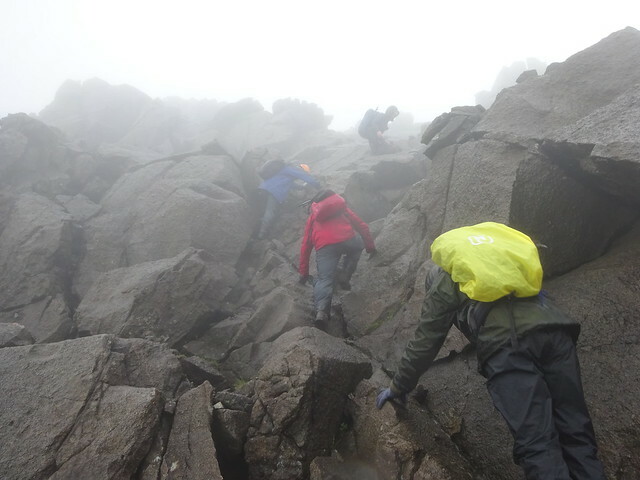 It's good that you enjoyed the scrambling and climbing despite the conditions. A lot of people say mist helps by obscuring the exposure, but I've always found it makes everything more intimidating and harder to 'read'. Well done! The Rodmiester wrote: Superb stuff, off to read it again. Cracking photographs, pity about the low cloud. Thanks Rodmiester! More views would have been nice, but I had such a great time nonetheless. Never a dull moment even if the weather was dull. I know what you mean, but don’t be put off. If you’re unsure, hire a guide. It made all the difference for me! I recommend Paddy. He knows every rock and gauges people’s abilities/ levels of confidence really well. He'll assist when needed, but also let you get on with it if you manage fine on your own. scottishkennyg wrote: Superb outings there SH and the images really help amplify the experience for the reader. You'll be back for the wee drop on the saddle and hopefully some clear views on the rocky cool ones too.. Thanks scottishkennyg! 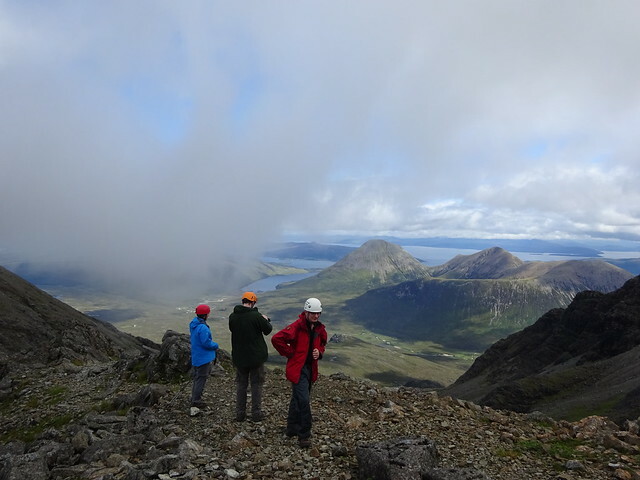 Yes I will most definitely be back to Forcan Ridge and the Cuillins, great playgrounds! Thanks ancancha! I’m glad you like the pictures. I think I’ve discovered a new hobby! 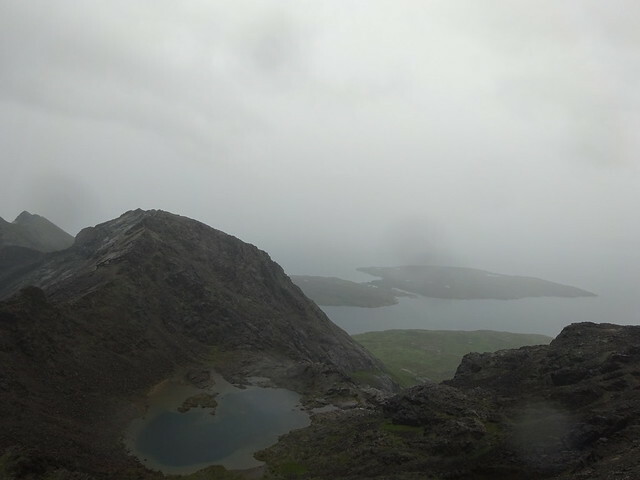 Sgurr wrote: What a week despite the sometimes iffy weather. As one who returned to Skye again and again and only did it in bits, your week sounds like really hard work, specially in the sometime rain. Good for you for packing in a course like that. 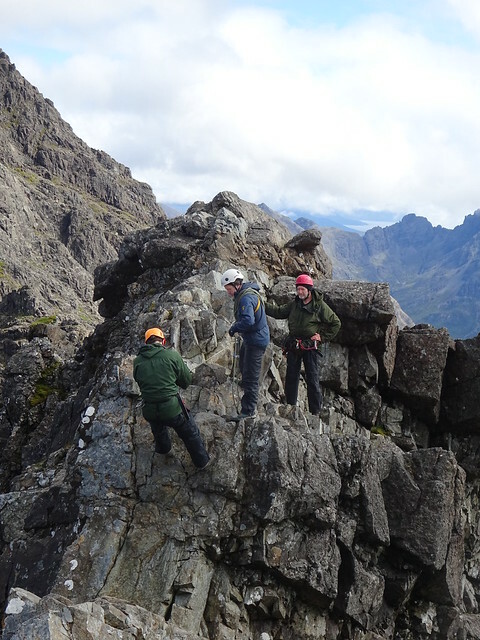 All reports I have read about the Cuillin make it clear that the guides there are great at giving folk confidence. 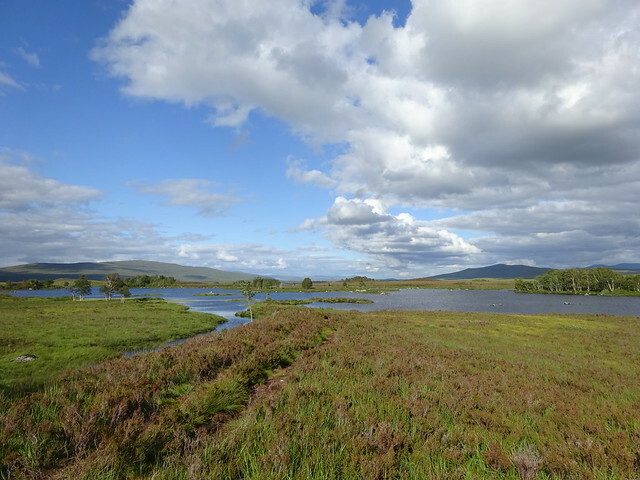 Husband had already done all but the Inn Pin with a friend when in his thirties, but was rather less sure about taking me (then early '60s) round some of the harder ones, so we got Mike Lates for a day consisting of Inn Pin, McCoinnnich and Alasdair and a year later for Bruach na Frithe, Am Basteir and Gillean. 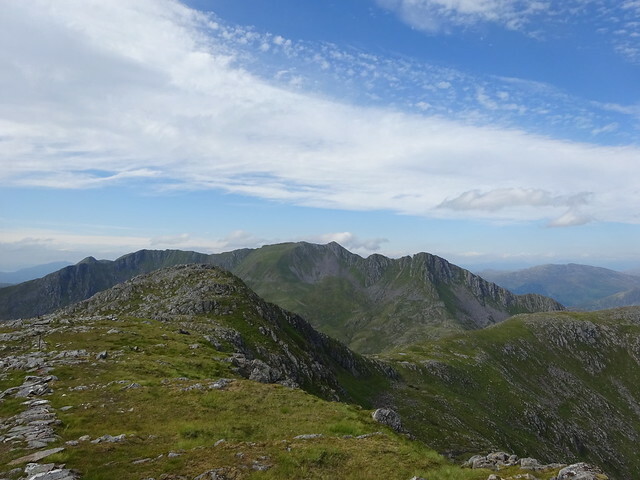 Like you, (but leaving a week or two) I then felt fine to tackle the Forcan Ridge. It's all easy cruising for you now......well, almost. See you still have the Fisherfield, but that is logistics rather than scariness. 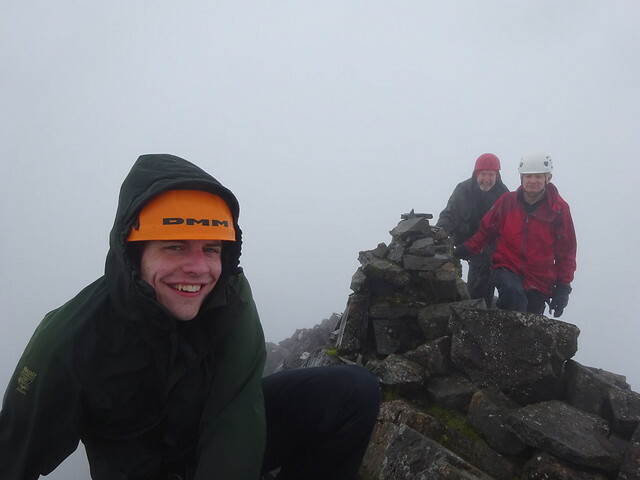 Cheers Sgurr! It wasn’t too bad, walking with a group makes it easier. I did find the 5th day tiring though, with all the concentration required. I agree about the guides being great at giving confidence. A few simple instructions and that tricky move becomes fun and achievable. 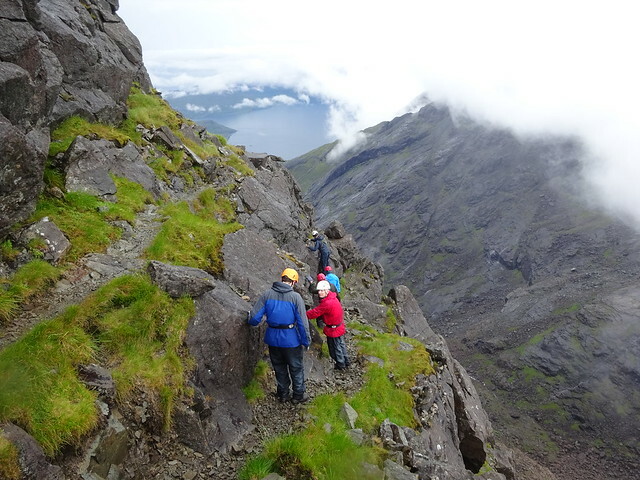 I’m so glad I hired a guide and took the plunge with the Skye munros. All I have learned and the confidence gained will come in handy for the Aonach Eagach, the Torridon Three and An Teallach. Not sure they will be easy cruising though. SecretSquirrel wrote: Fantastic, well done! 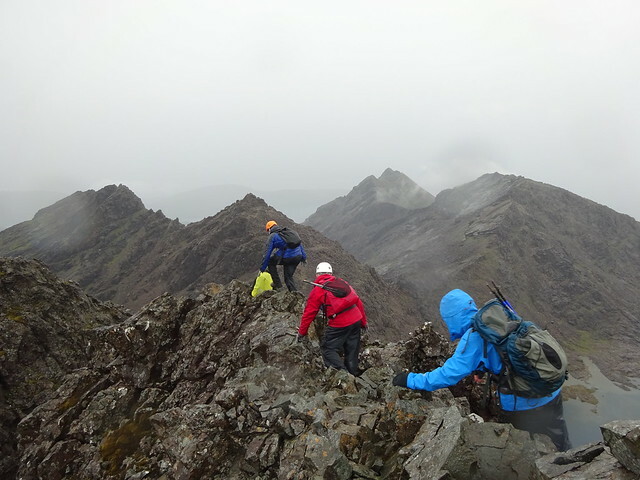 martin.h wrote: We've been toying with the idea of doing the Skye munros for a while now and reports like yours give us the nudge to get on with it. The accommodation is booked, now for the guide. 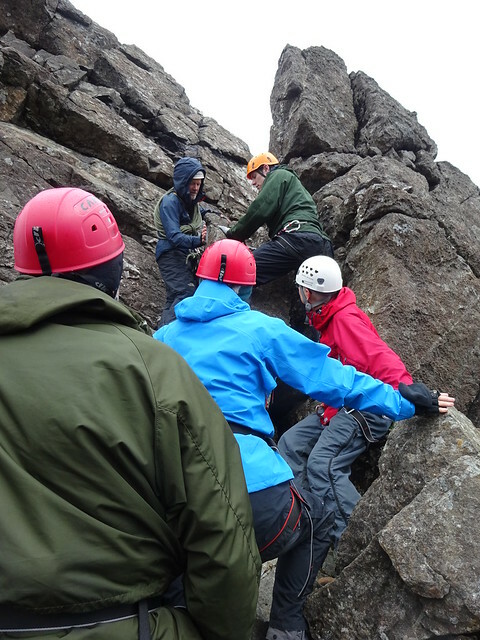 Thanks for a great report Silverhill, it looks like a fantastic experience. Cheers. 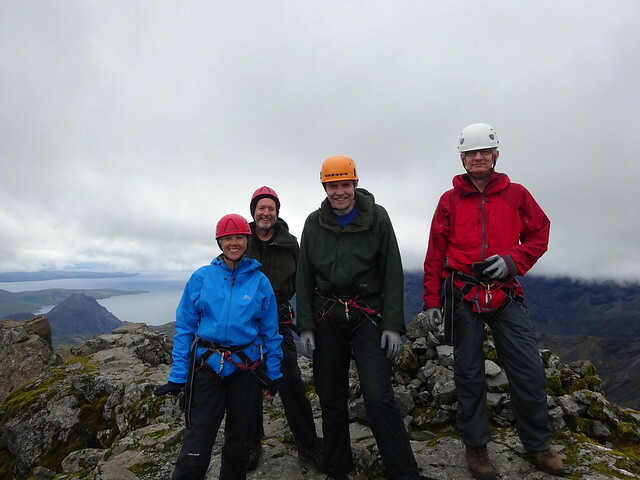 I’ve only heard positive stories about guides for the Cuillins on here, so found it difficult to choose. I decided to go for whomever offered the most convenient date. Turned out to be an excellent choice! Great pictures of the cloud breaking around the tops. Paddy is a good lad, does the wee bugger still fart like a howitzer?? Thanks Huff_n_Puff, dav2930, rockhopper and litljortindan! Same here, a real confidence boost and I wish I had discovered scrambling and climbing earlier! 182 is a special milestone, back to double figures, and good to reach it on Skye! dav2930 wrote: A lot of people say mist helps by obscuring the exposure, but I've always found it makes everything more intimidating and harder to 'read'. Well done! A bit of both for me. In the mist everything looked very foreboding and I would not have liked to pick my own way around these hills. I rather enjoyed the views on day 4 and still didn't notice the big drops ! It was a really good week! Yes, Paddy made it all look so easy! litljortindan wrote: Great pictures of the cloud breaking around the tops. 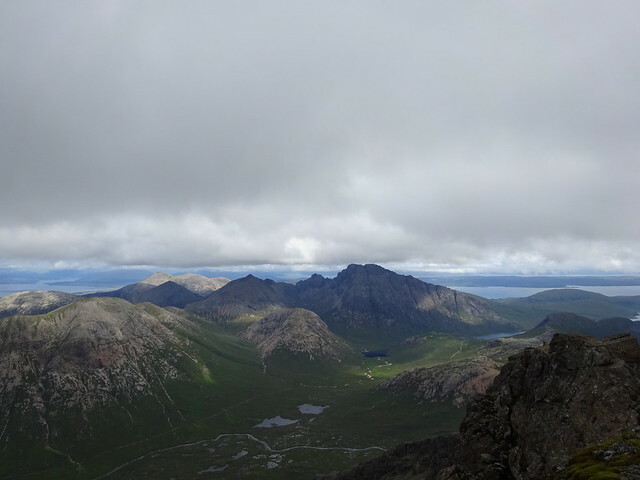 Yes, it was great to see the Cuillins reveal themselves on day 3!